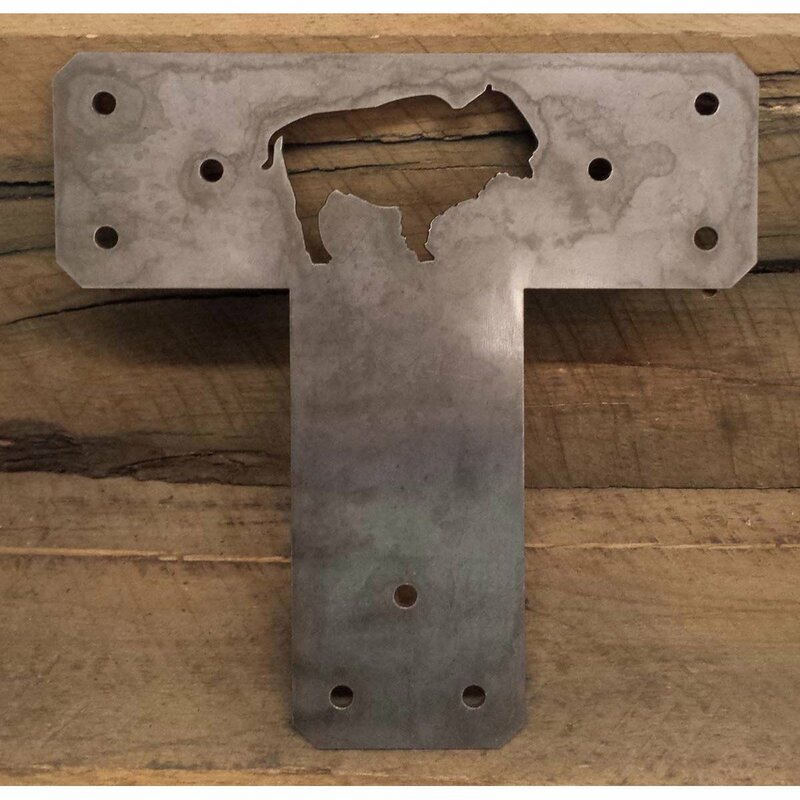 Facial or Flat Brackets / Truss Plates | Cutting Edge Metals Inc.
Facial brackets or truss plate connectors. 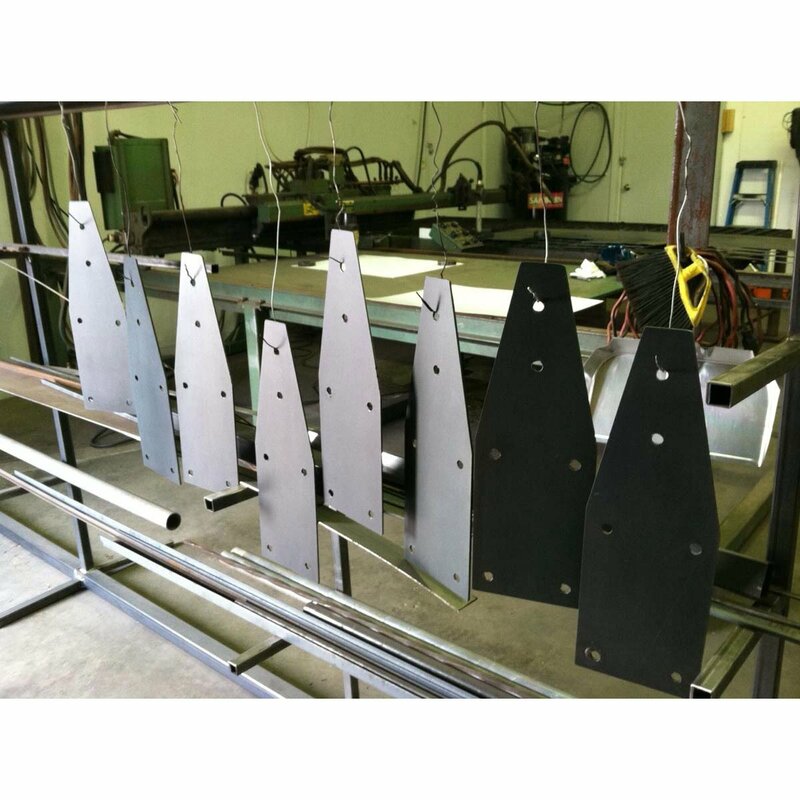 This page consists of beam brackets that you'd put on the "face" of your beams or truss which is the exposed part, that is in view when you are standing in front of it. 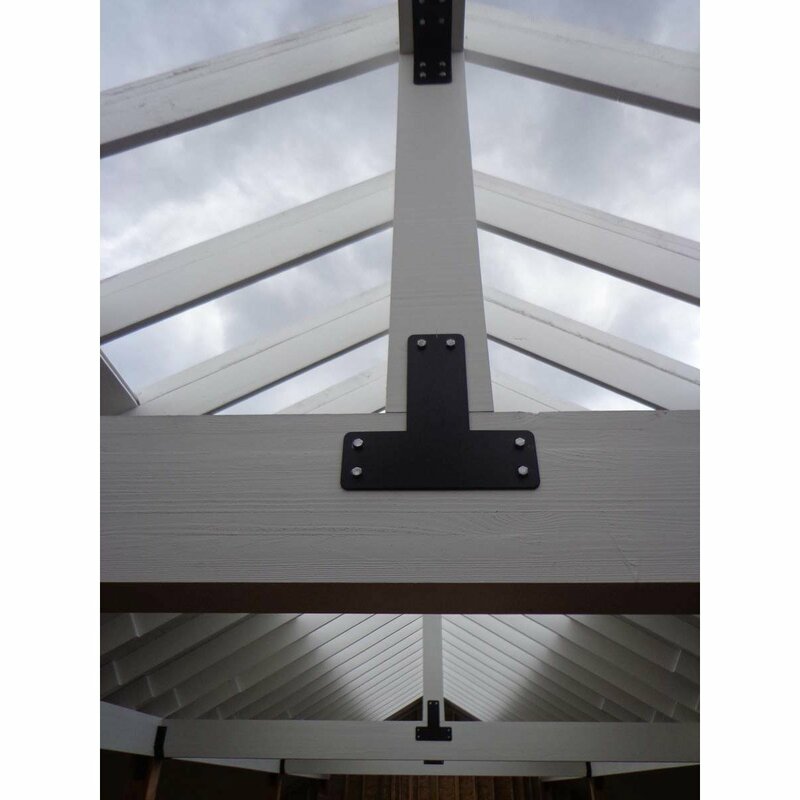 These are great for pergolas, timber framing, trusses and a lot more. 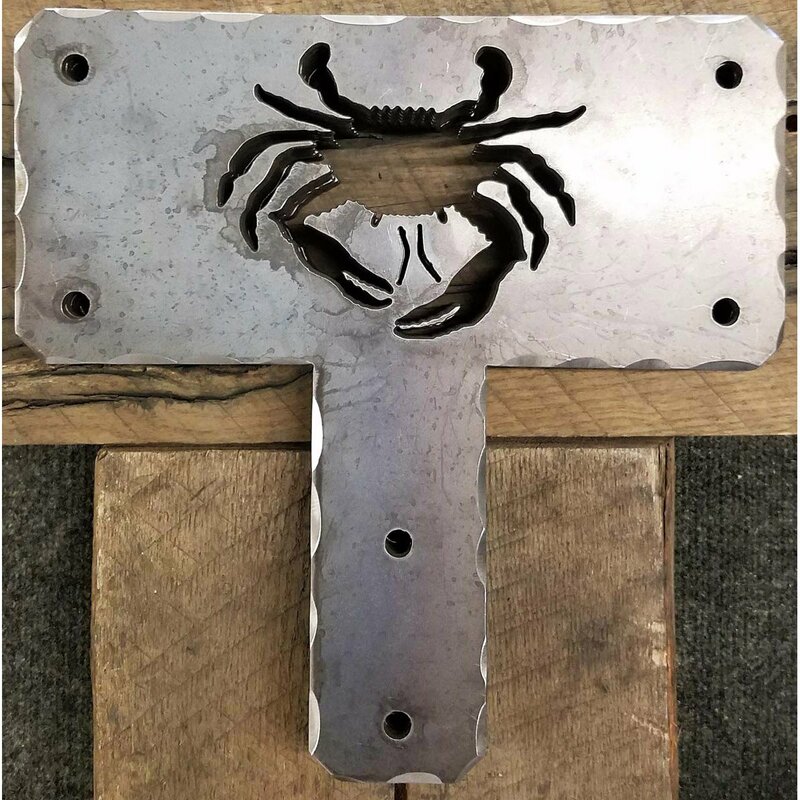 We make these custom steel connector plates to your specifications. 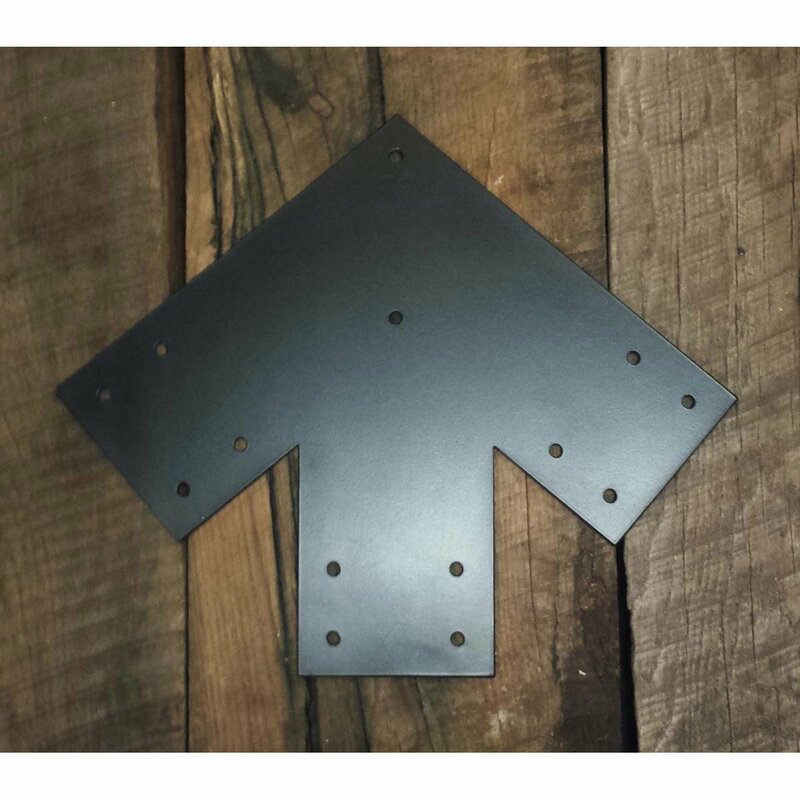 You can choose the size, thickness, hole size and placement and finish to your liking. 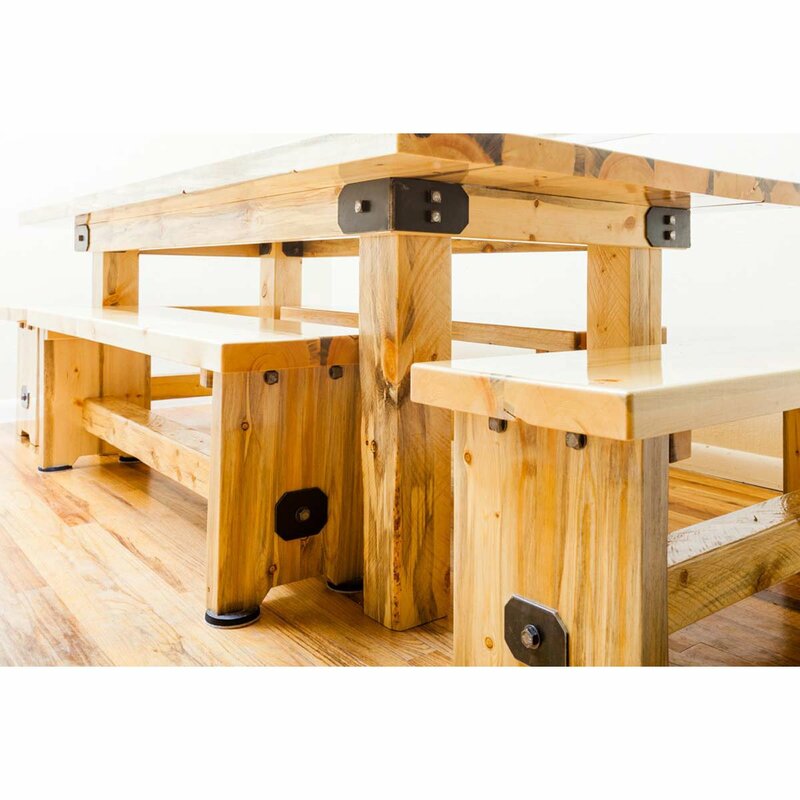 If you'd like to discuss your project with us or get pricing for purchase, you can reach us at (715) 718-0781. 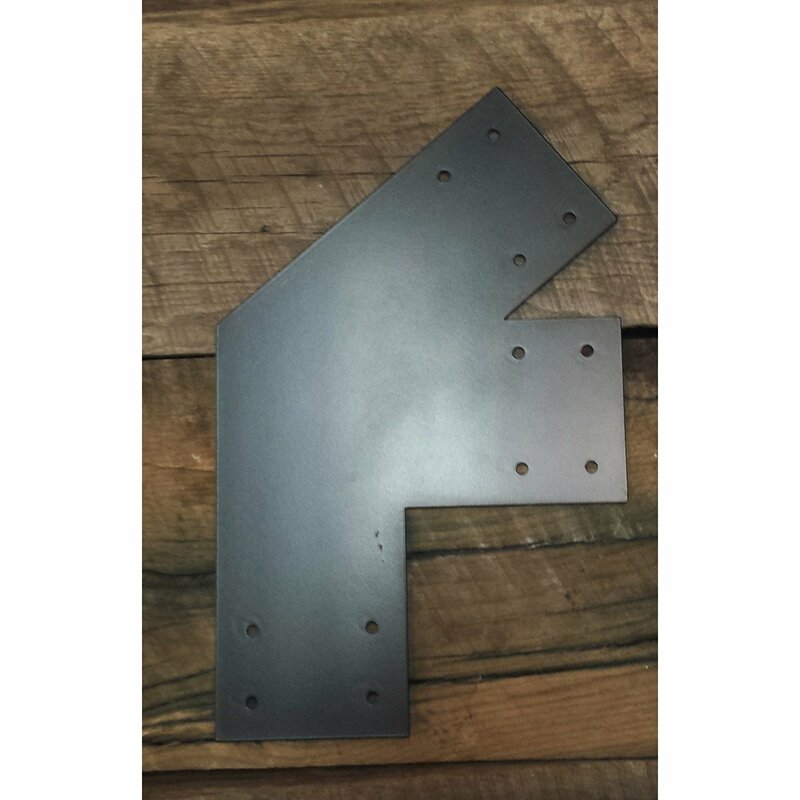 These custom 2 leg steel beam brackets are for the corners on your truss. 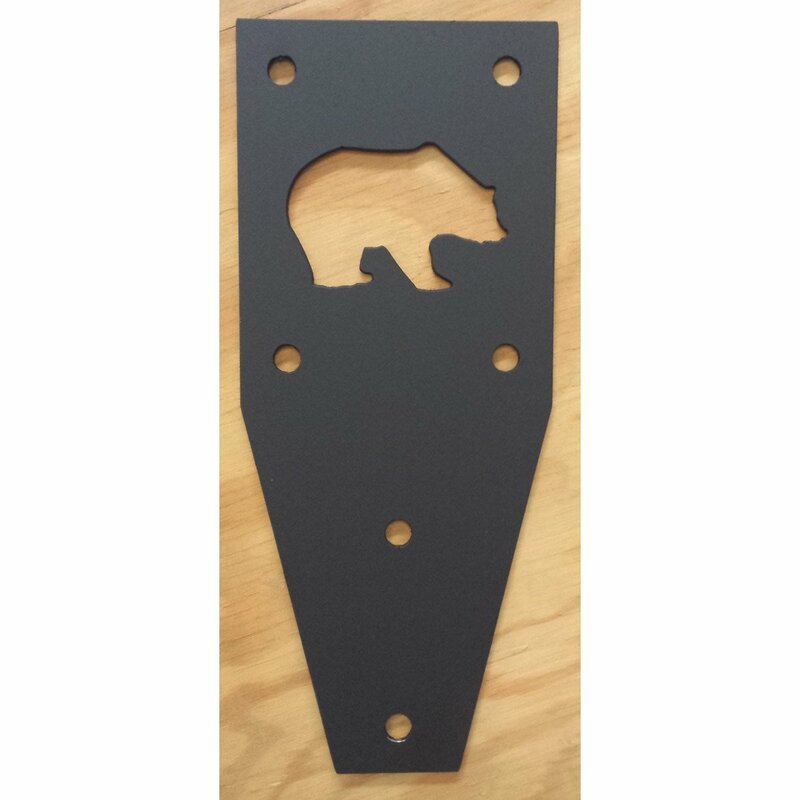 We can custom make truss plates to any size, angle, thickness, hole placement and size or finish. If you'd like a quote for your project or to order them, give us a call at (715) 718-0781. 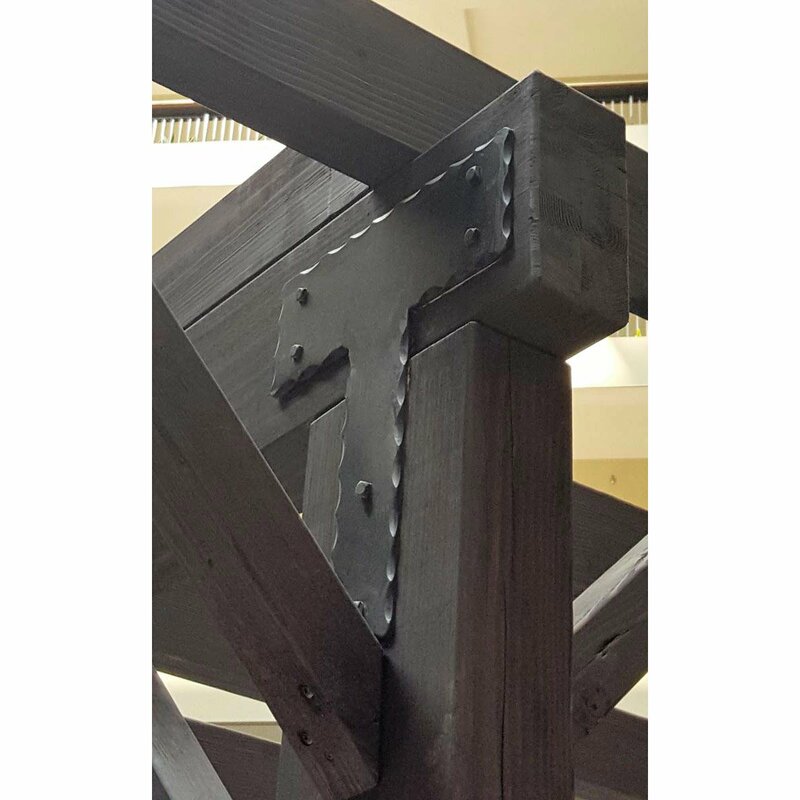 These connecting brackets are to connect a vertical and horizontal post and beam that also connect to a beam that is pitched toward the point of the roof. 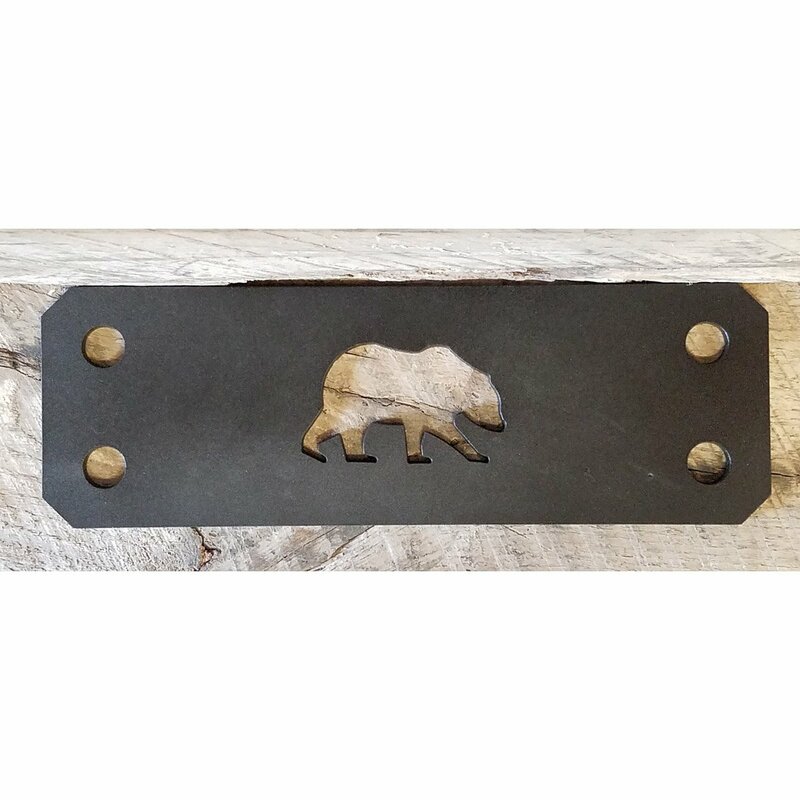 These work very well with the (BB-5L) below to accent the truss woodwork with steel. If you'd like to order some, give us a call at (715) 718-0781. 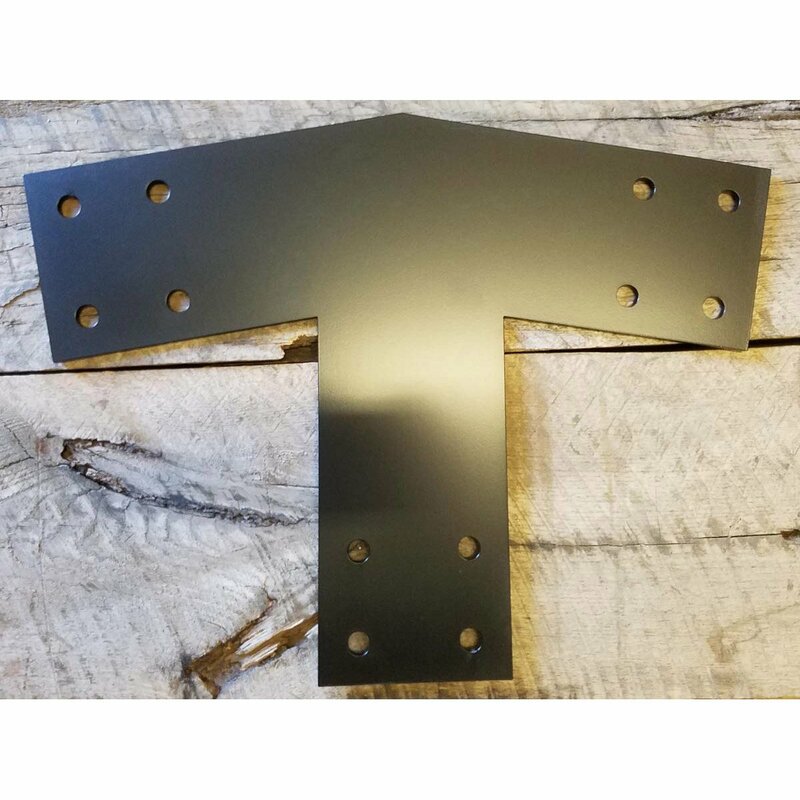 Here is a focal point truss plate for that entrance way into your home that you need to add steel to the beautiful wood truss you have already or are building. 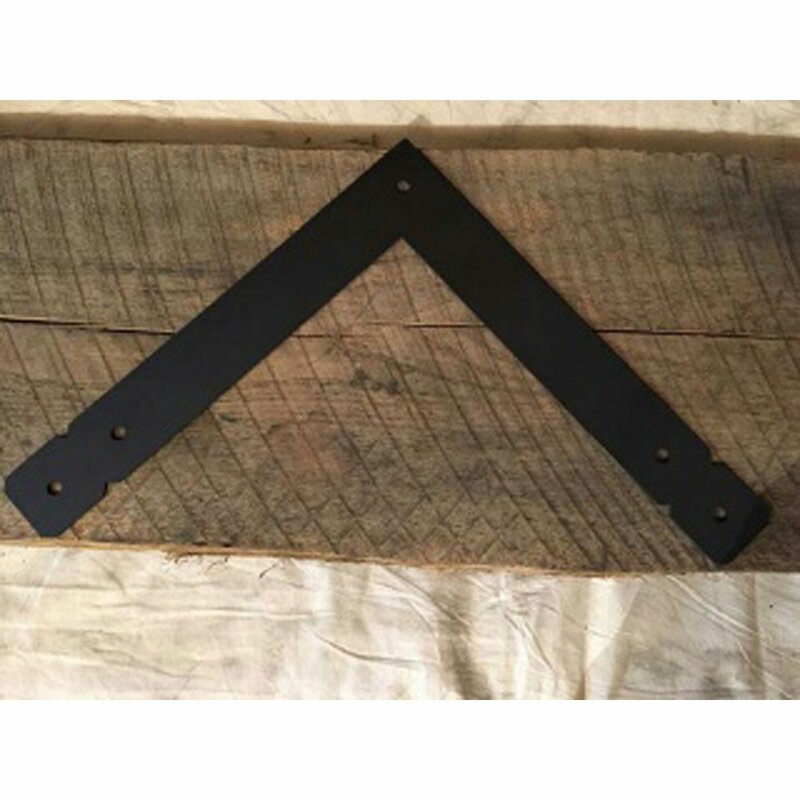 This decorative steel multi-legged steel bracket will increase the value of your home, increase the strength of the king post / angle brace connection. 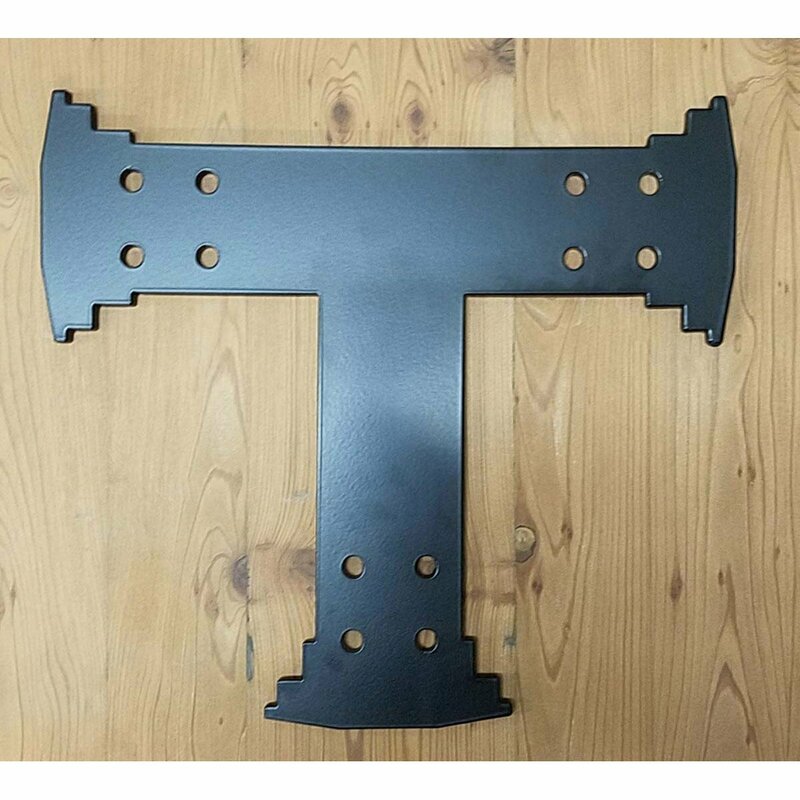 We custom make these in all sizes and shapes so please contact us at (715) 718-0781 directly so we can help you to design this bracket so it fits perfectly in your space. 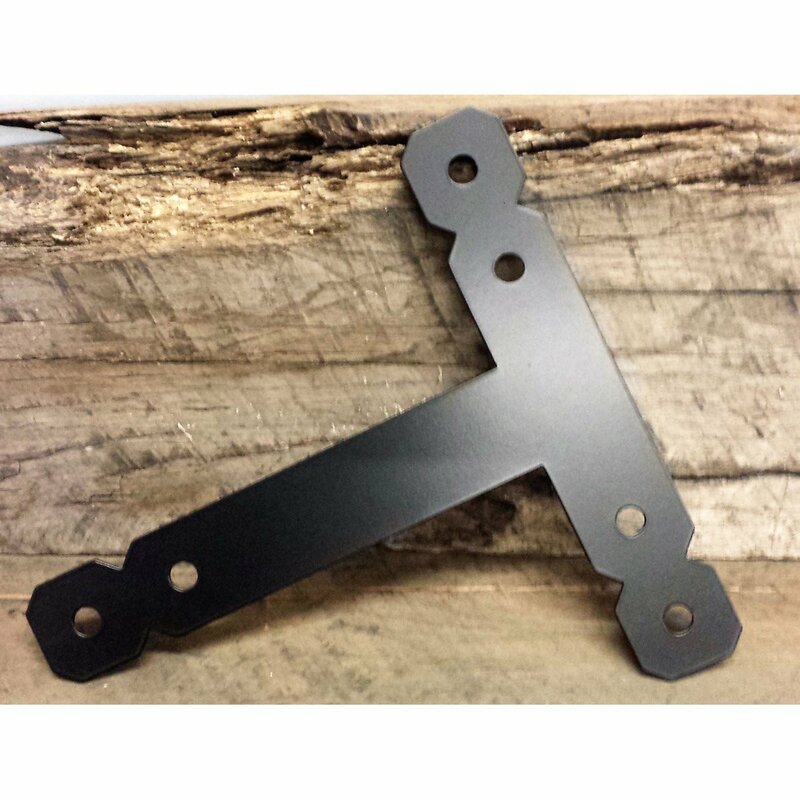 This bracket ties everything together at the top of your roof pitch on your truss. 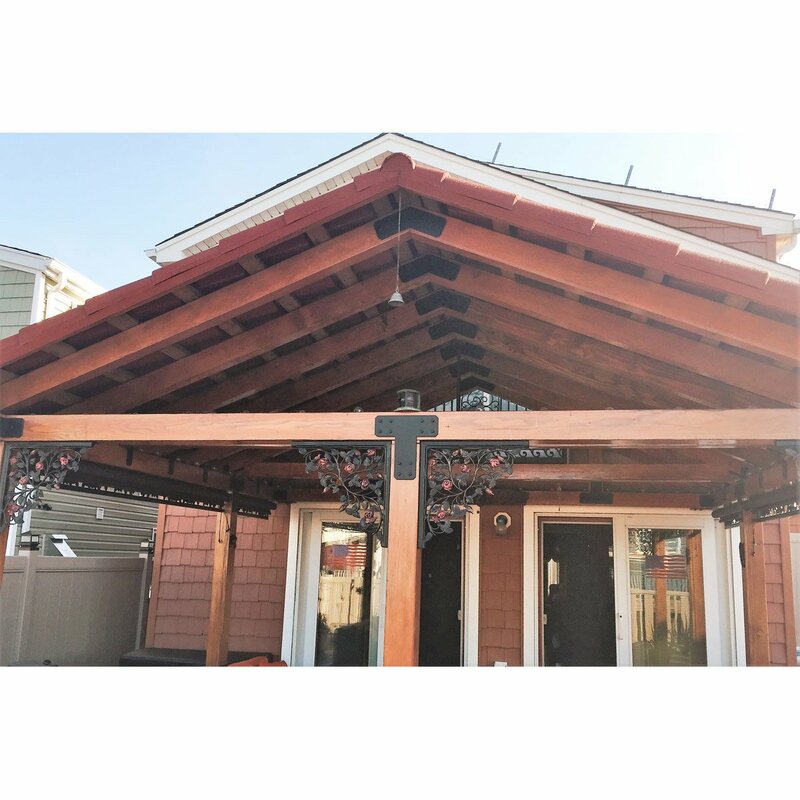 You have the vertical post (king) connecting to the top two rafter beams and this makes them look great. 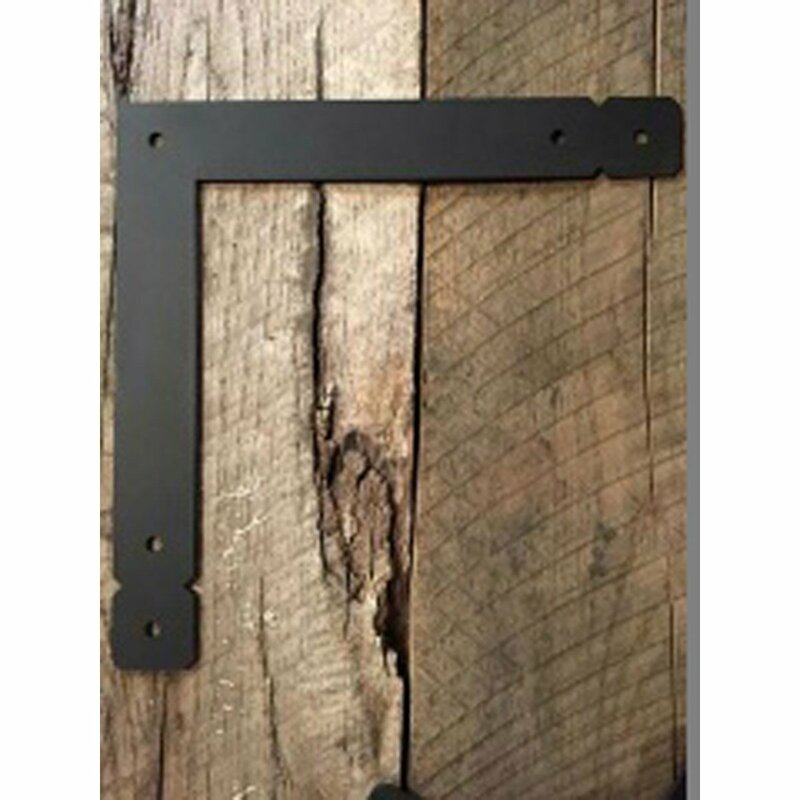 This coupled with the brackets listed above make any entrance complete. If you'd like to order some, give us a call at (715) 718-0781. 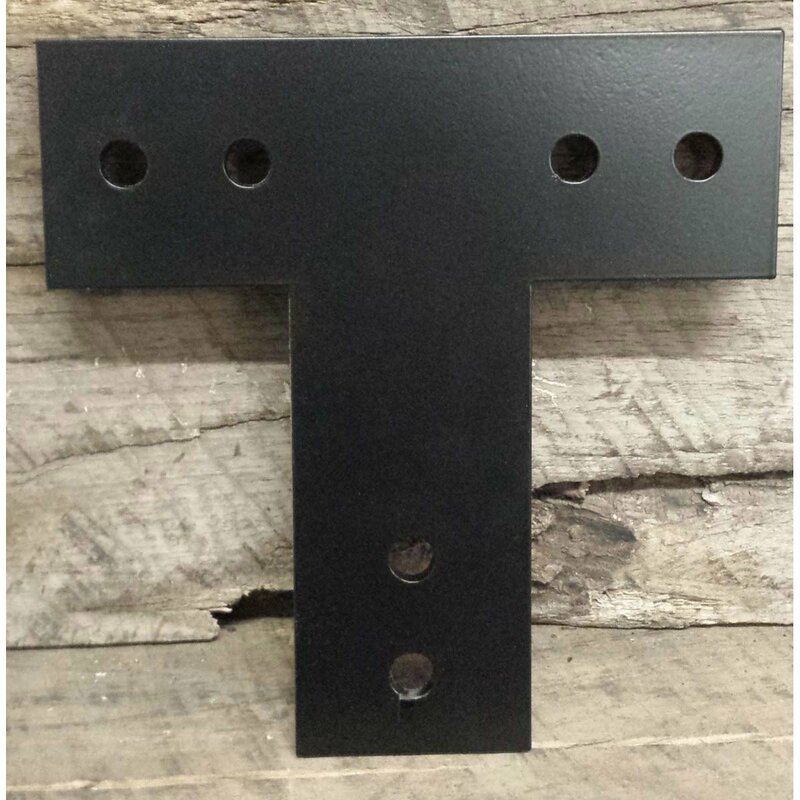 These custom steel facial T-brackets are to connect beams to the top of a column or post. 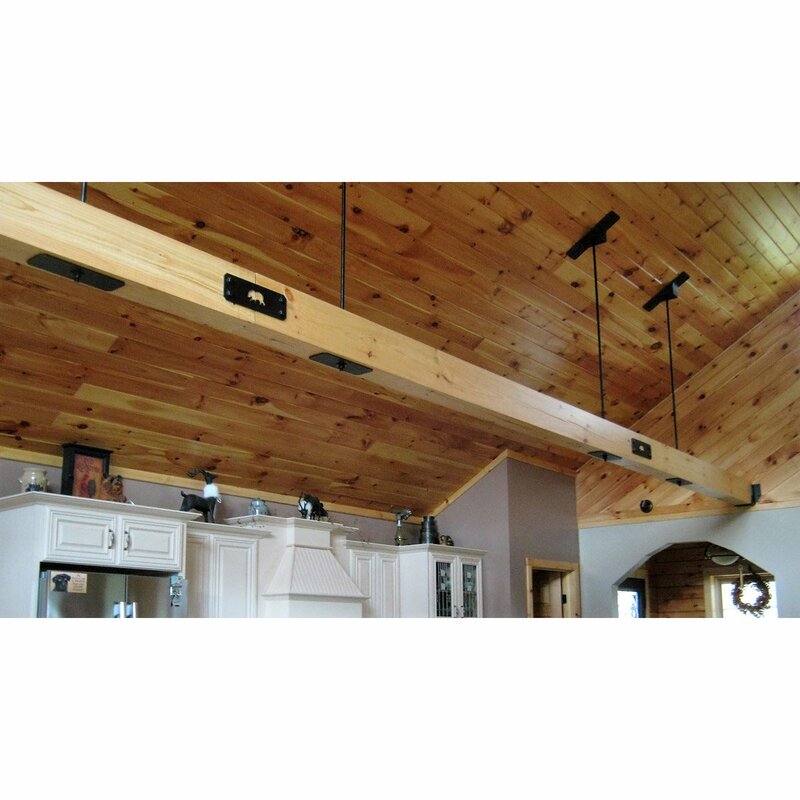 You can specify the dimensions of your beams and posts to fit perfectly and so aesthetically, they look great installed in your building or home. 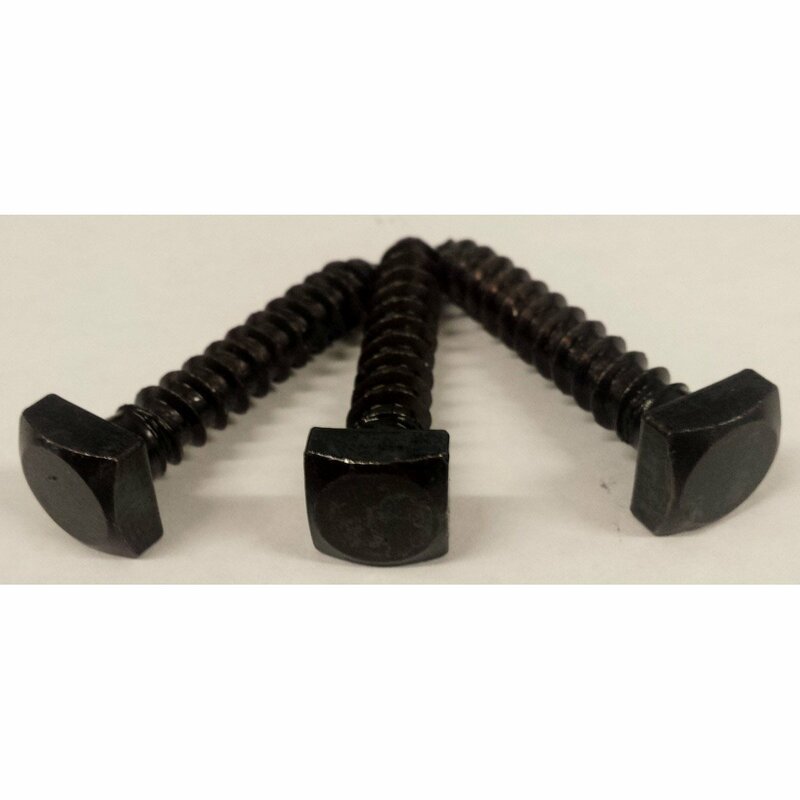 Remember to also let us know what size bolts or lags you'll be using so we can make the holes the correct size for an easy fit. We can also hammer them to give them an extra finishing touch of class. Just let us know you'd like us to do that for you. If you'd like to order some, give us a call at (715) 718-0781. 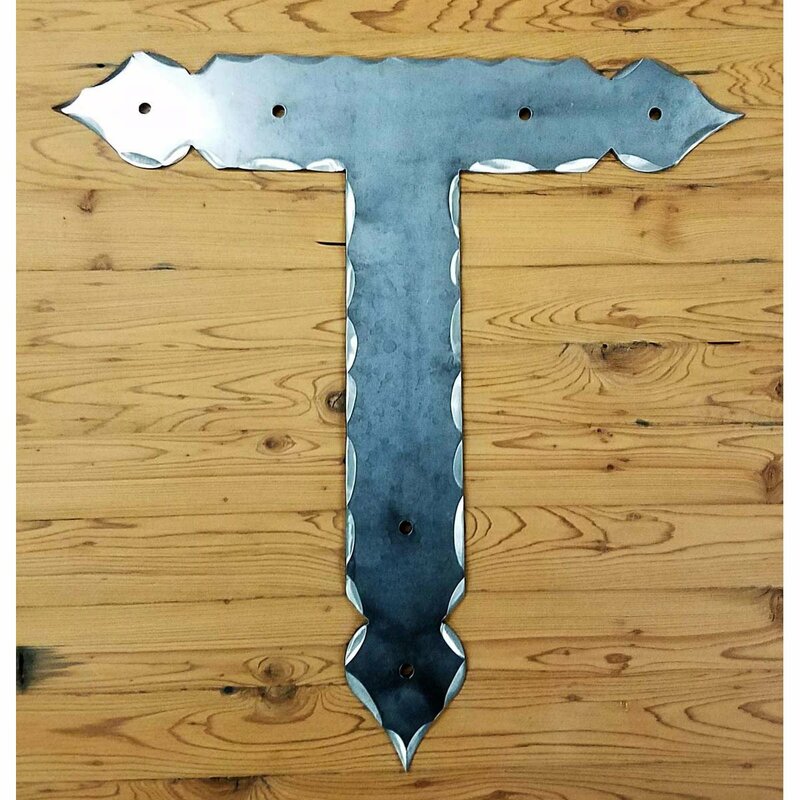 This is a very unique design for a T-bracket. 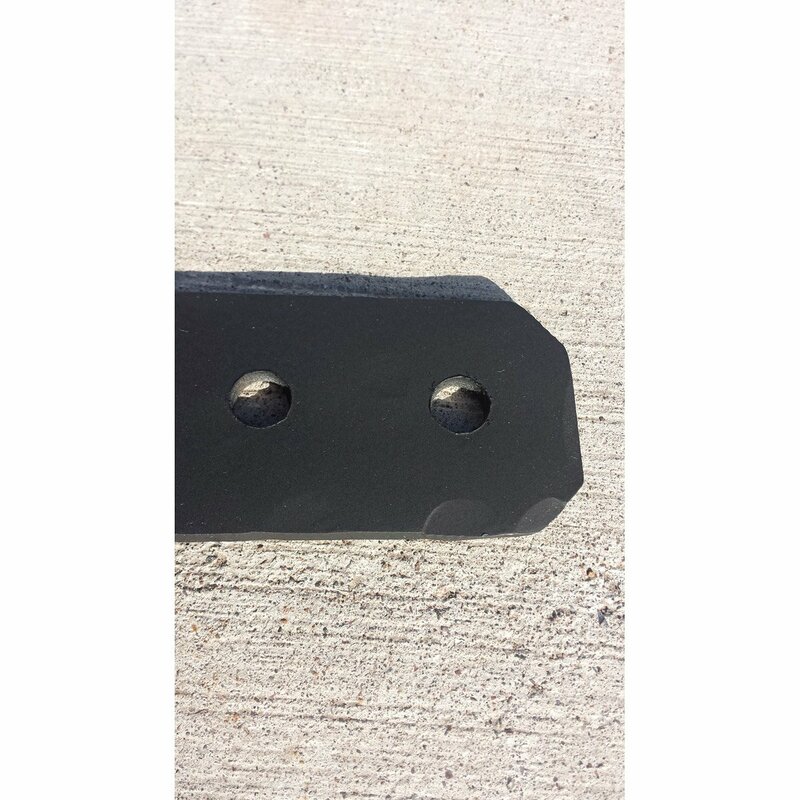 We custom cut these out of steel and make them the size of timber connecting bracket you need for your project. 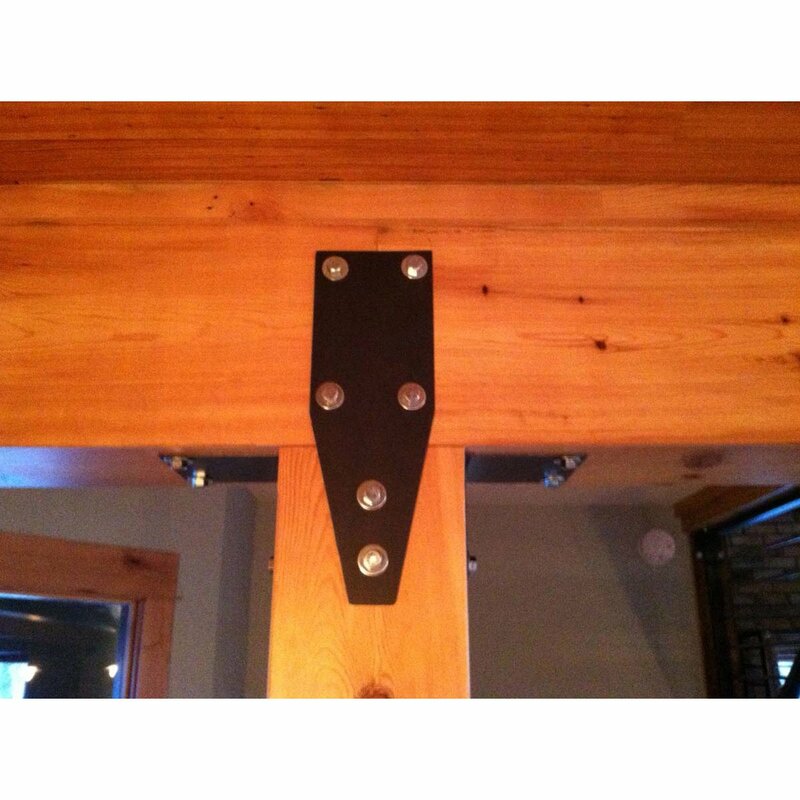 We think you will love the way these custom steel brackets look on your post and beams. We can do all shapes and sizes. If you'd like to order some, give us a call at (715) 718-0781. 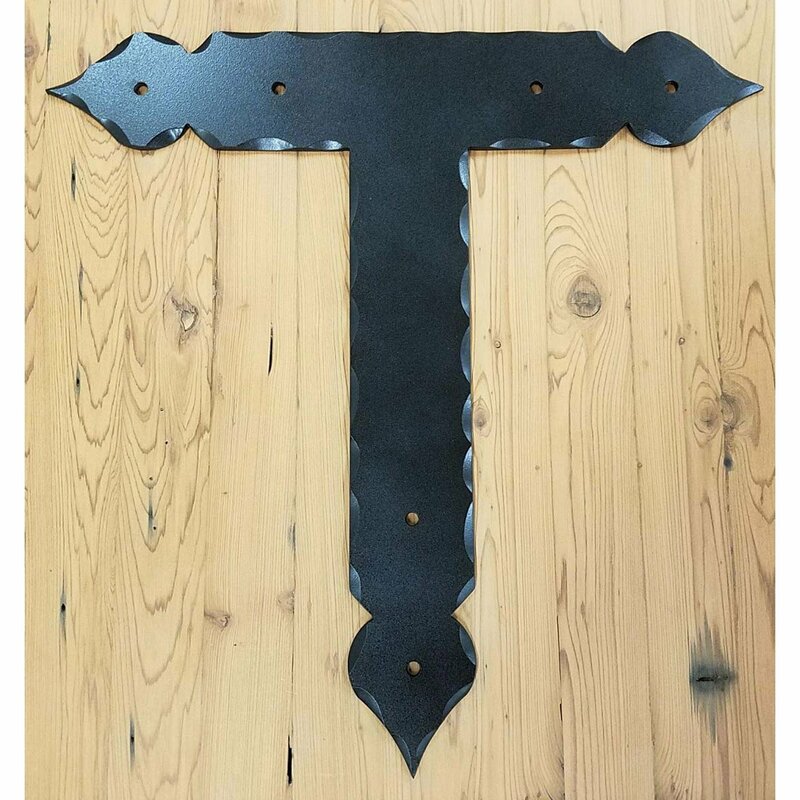 These are ultra decorative steel "T"-Brackets. 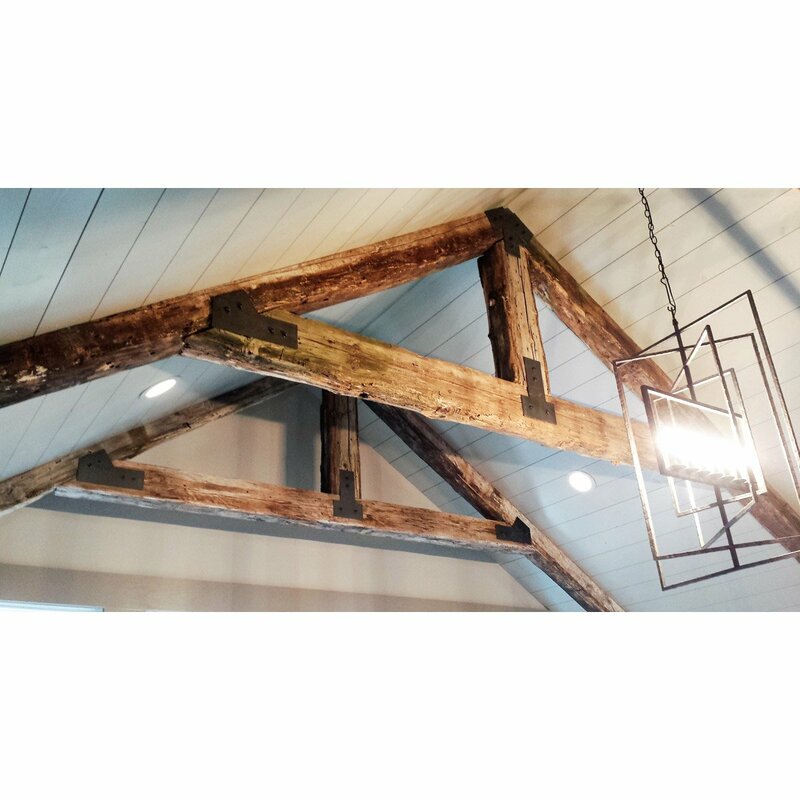 This post and beam bracket will dress up your timbers to look like they are in a castle. We hammer these to add more design and dimension. If you'd like to order some, give us a call at (715) 718-0781. 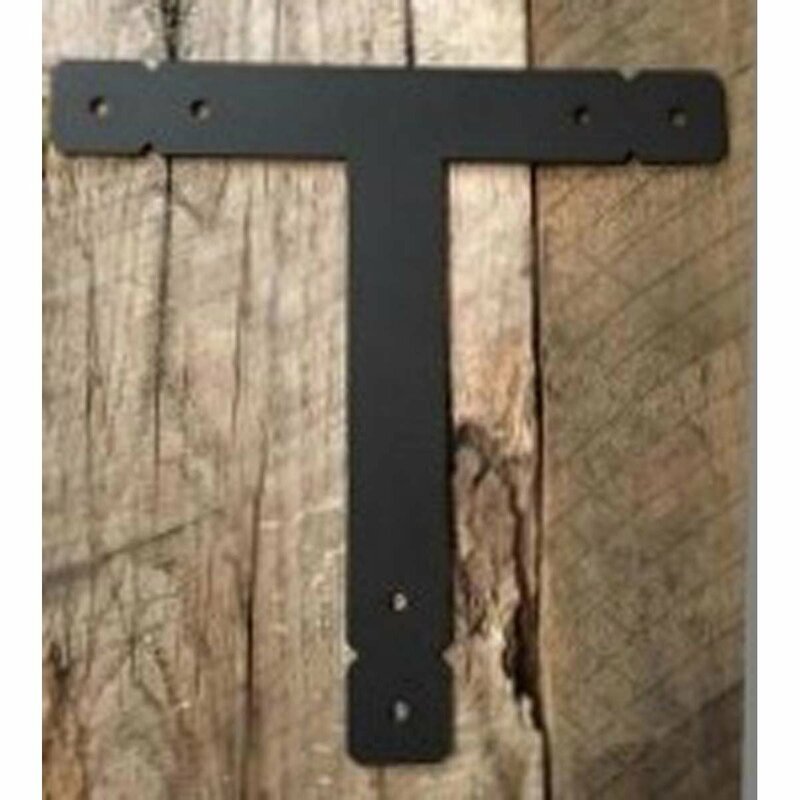 This "T" is for angle brace on your post to beam connections. If you have a post that has a support angle brace coming off of it, this works really well. We can hammer or crop the corners on this for you. 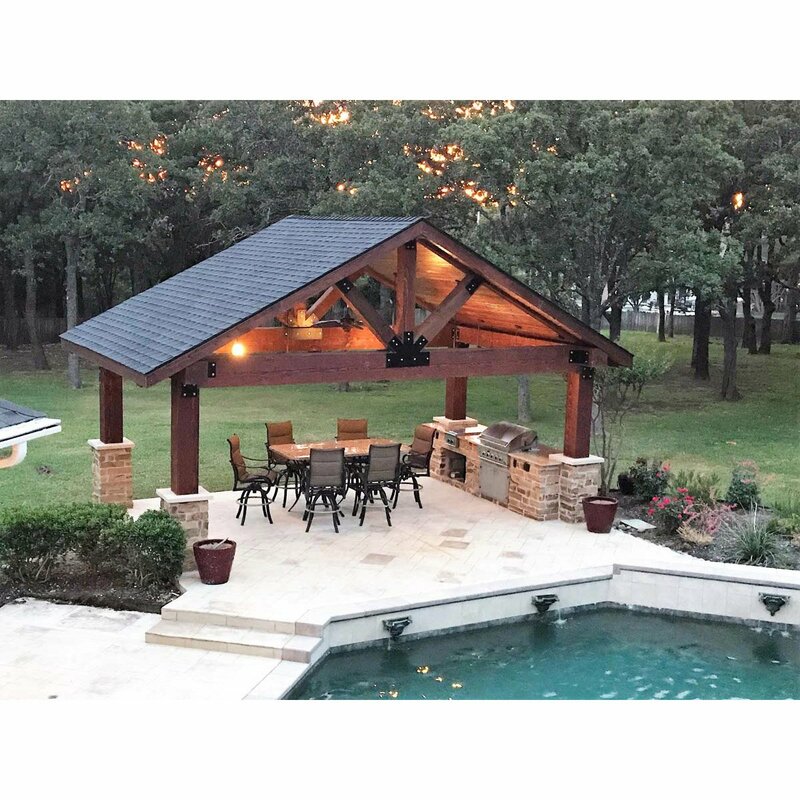 This adds strength and beauty to your project. Give us a call to discuss options with this bracket at (715) 718-0781. 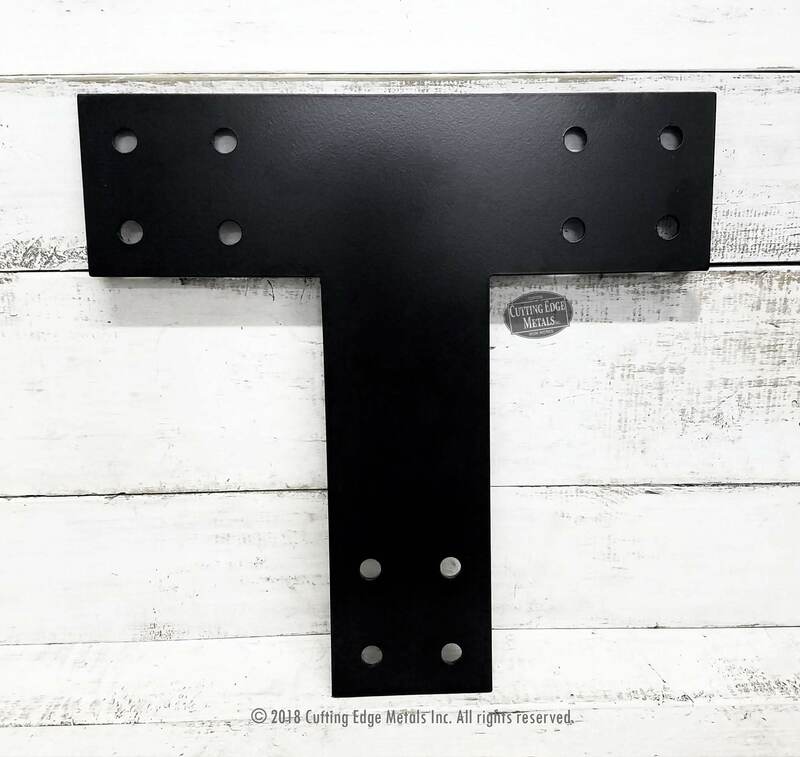 A uniquely designed steel "T" bracket that has a double cropped feature to add some detail to your timber frame post and beam project. This is a nice way to dress up your project and add that look you're going for. 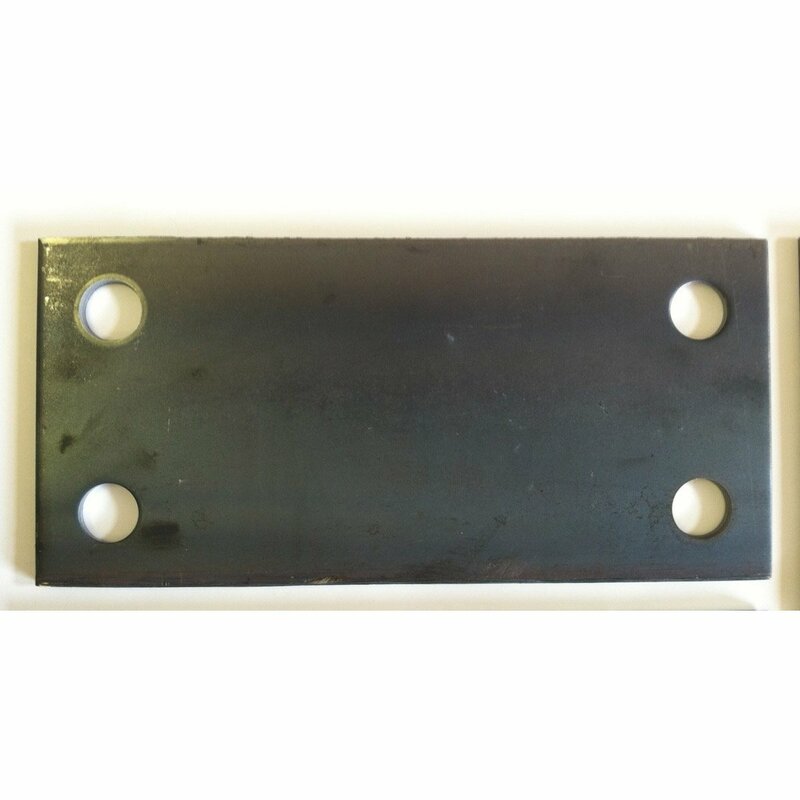 Also, take a look at the "XB-12" and the "LSB-12", which are the sister brackets to this style. You can even ask us to hammer them, like the picture shows below. If you'd like to order some, give us a call at (715) 718-0781. 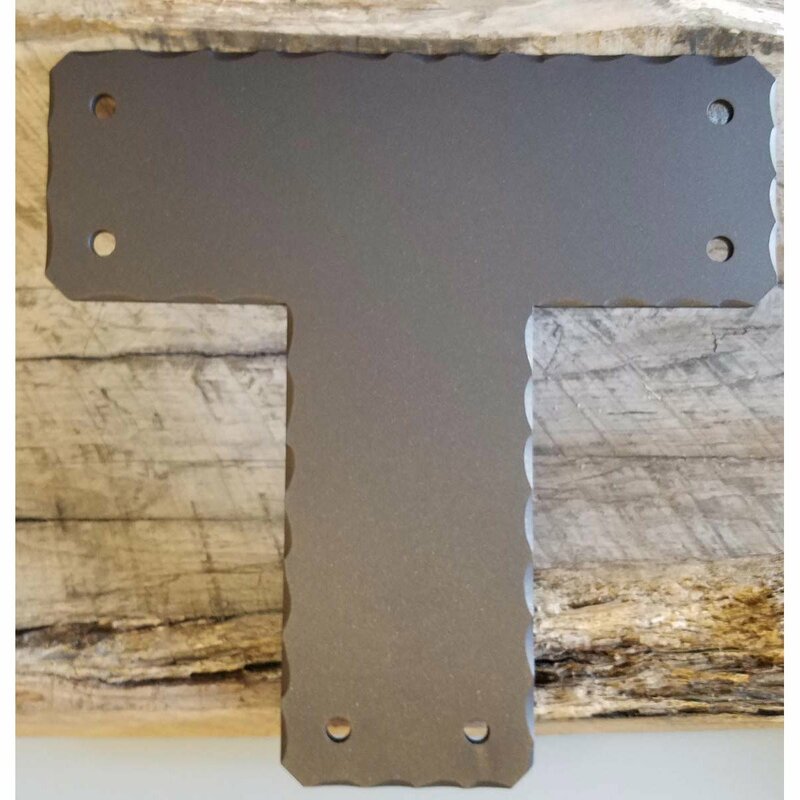 Here are some steel "T" brackets that can be customized any way you want them to and made to any size for timber framing. These are more decorative as they have a cut out in them. If you have an idea for a project, please call us directly at (715) 718-0781 and we can get you a quote. 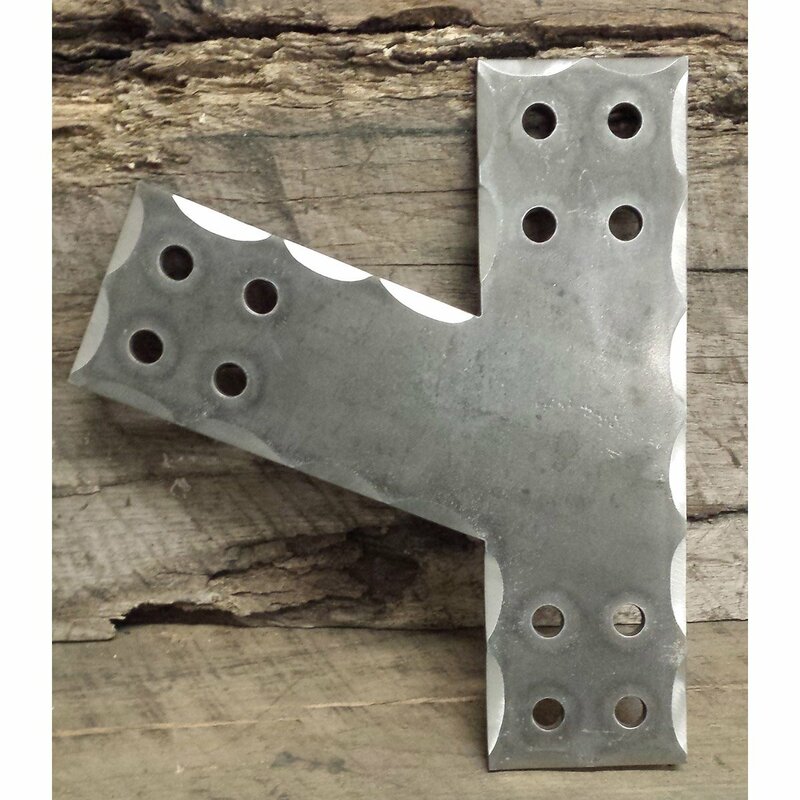 A uniquely designed steel "L" Shaped bracket that has a double cropped feature to add some detail. 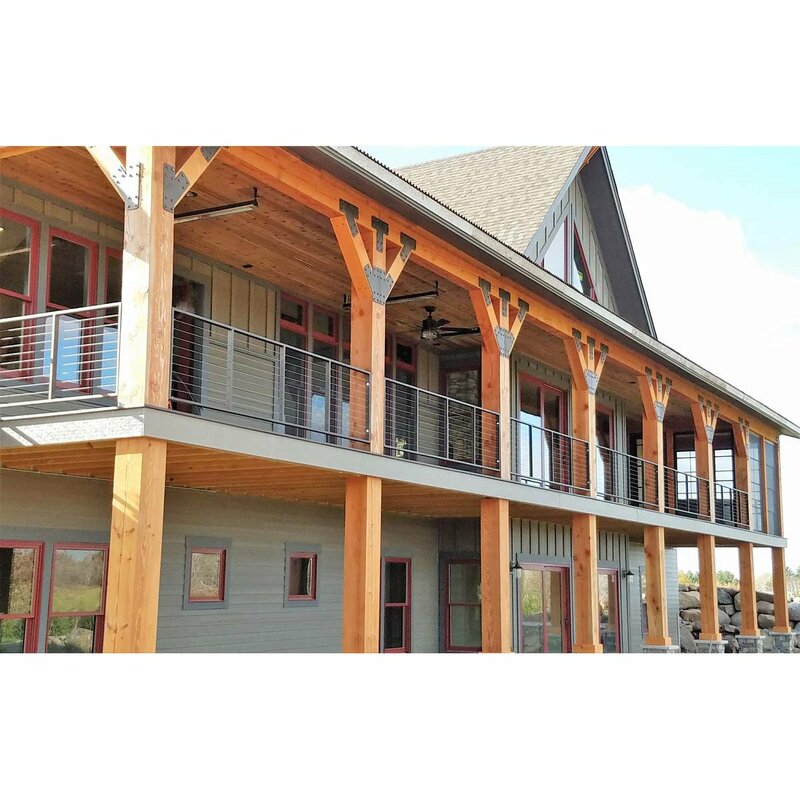 This is a nice way to dress up your timber frame project and add that look you're going for. 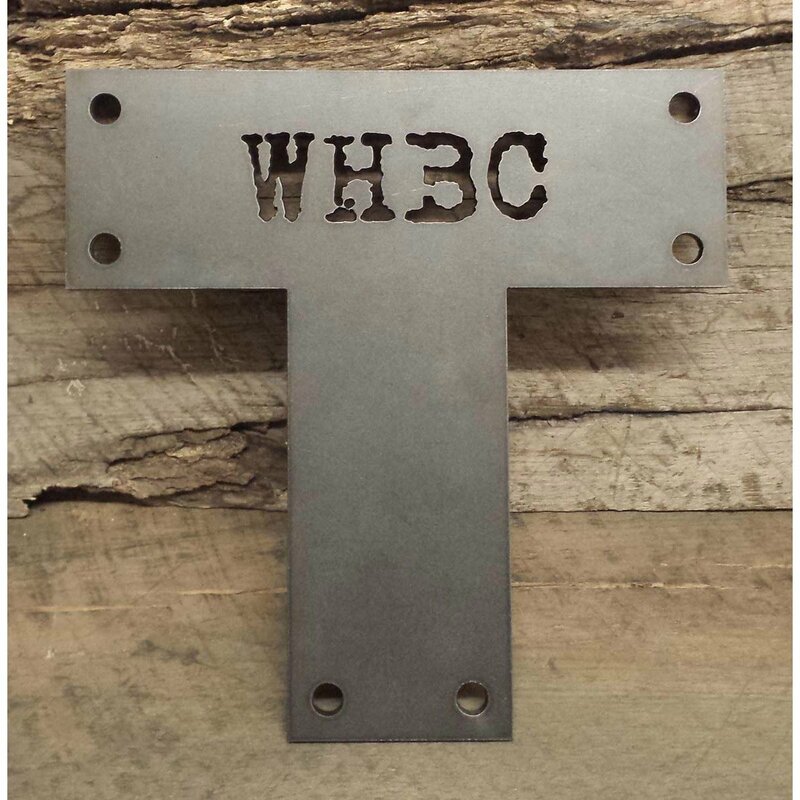 Also, take a look at the "XB-12" and the "TB-12", which are the sister brackets to this style. If you'd like to order some, give us a call at (715) 718-0781. 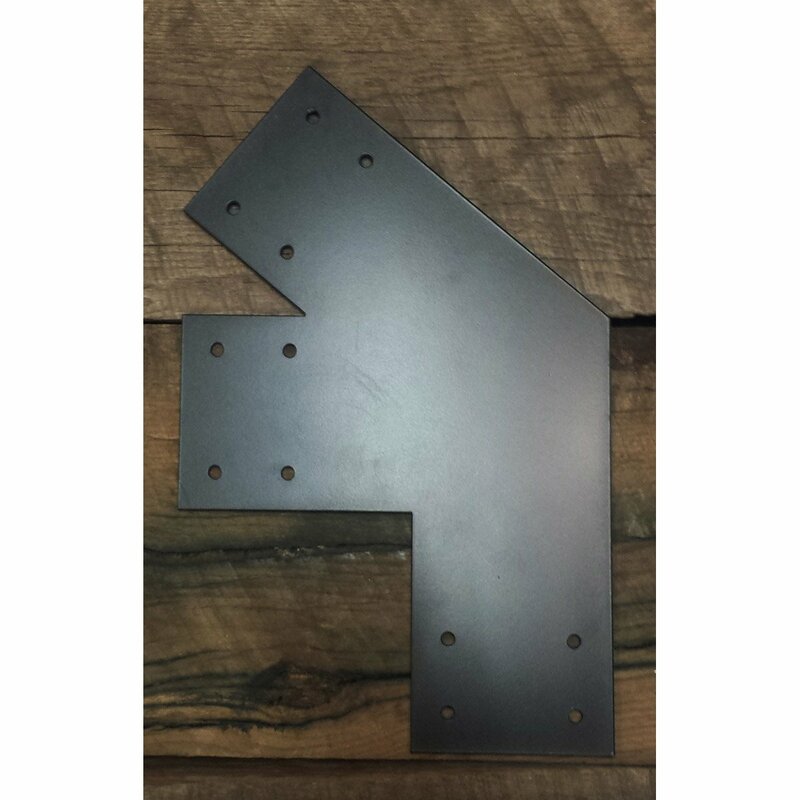 Here are some "L-Shaped" timber frame brackets for your post and beam connection that we custom make, hammer and finish to give an "old iron" feel. 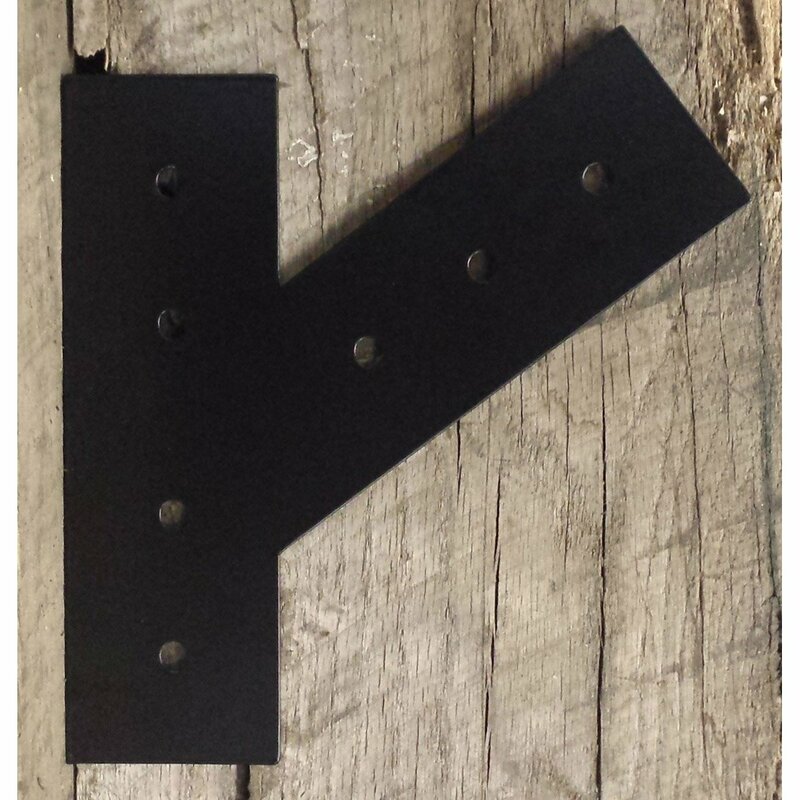 These can be made to your spec and look great on reclaimed lumber or any other wood beams and posts you want to dress up. If you'd like to order some, give us a call at (715) 718-0781. 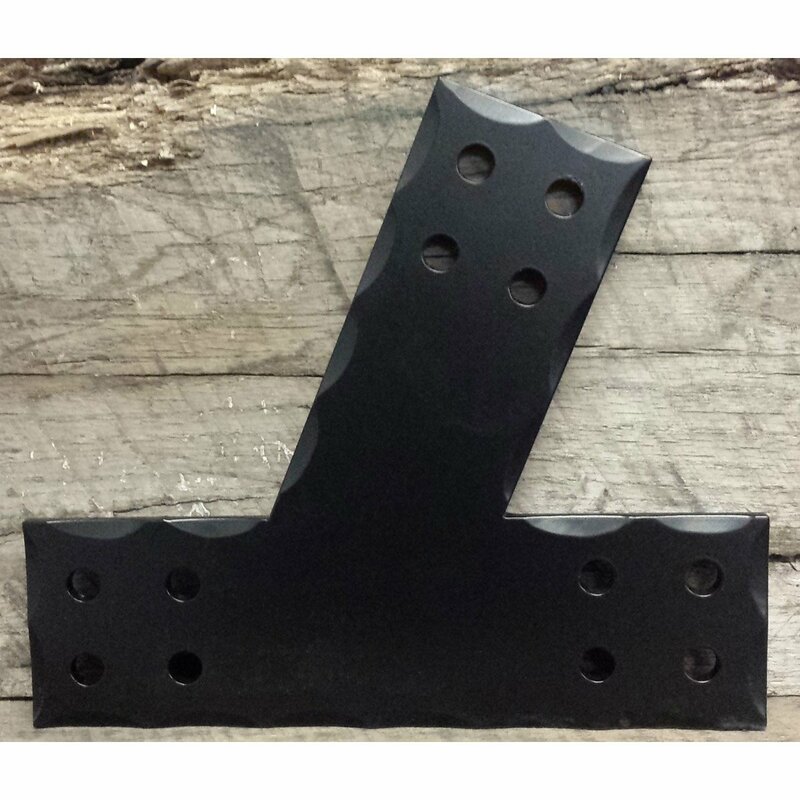 These decorative, spaded "L" Shaped brackets are just the touch you might need for your timber frame project. 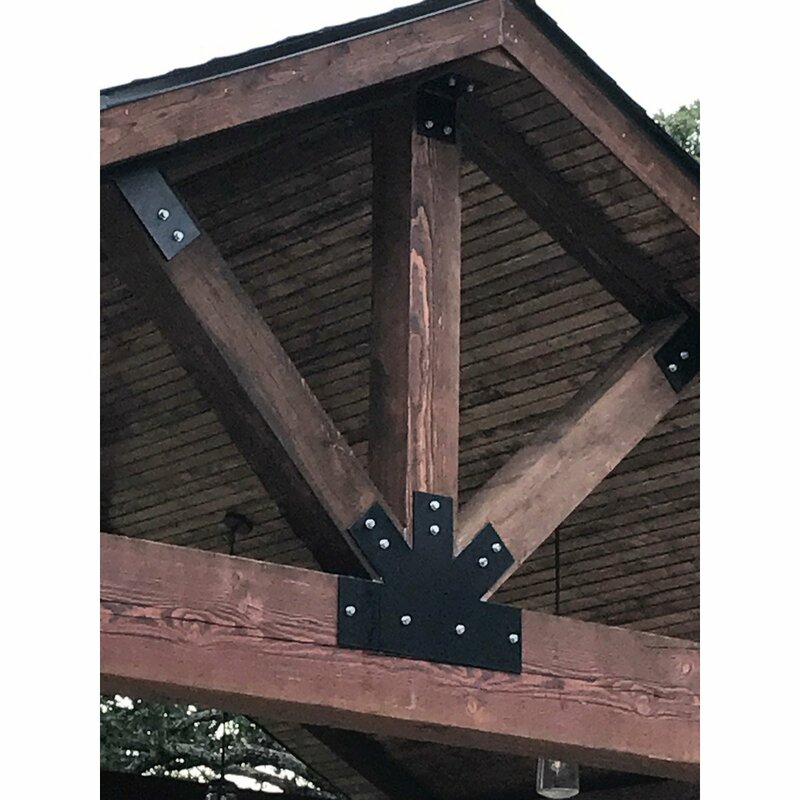 These add some serious beauty to the design of any corner post and beam connection. 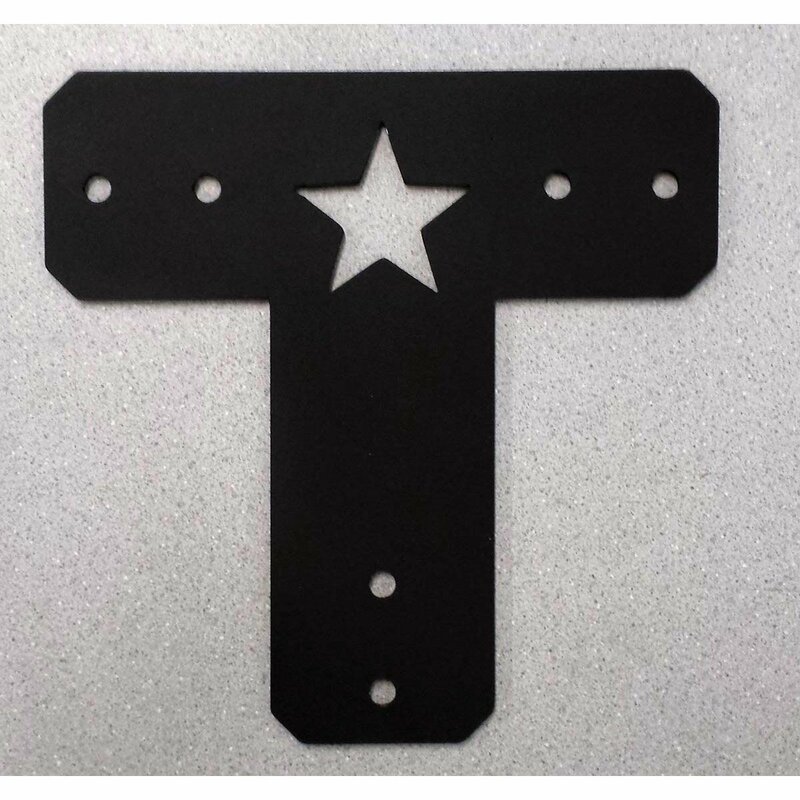 We can make these in different thicknesses and sizes. These can be hammered or just left plain. 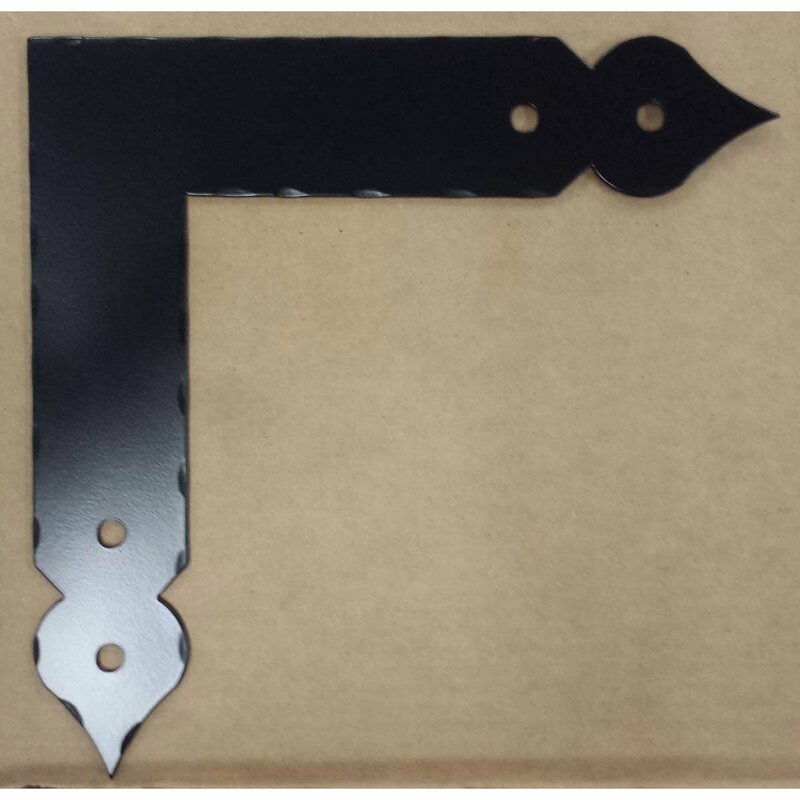 Give us a call to talk about these decorative brackets at (715) 718-0781. 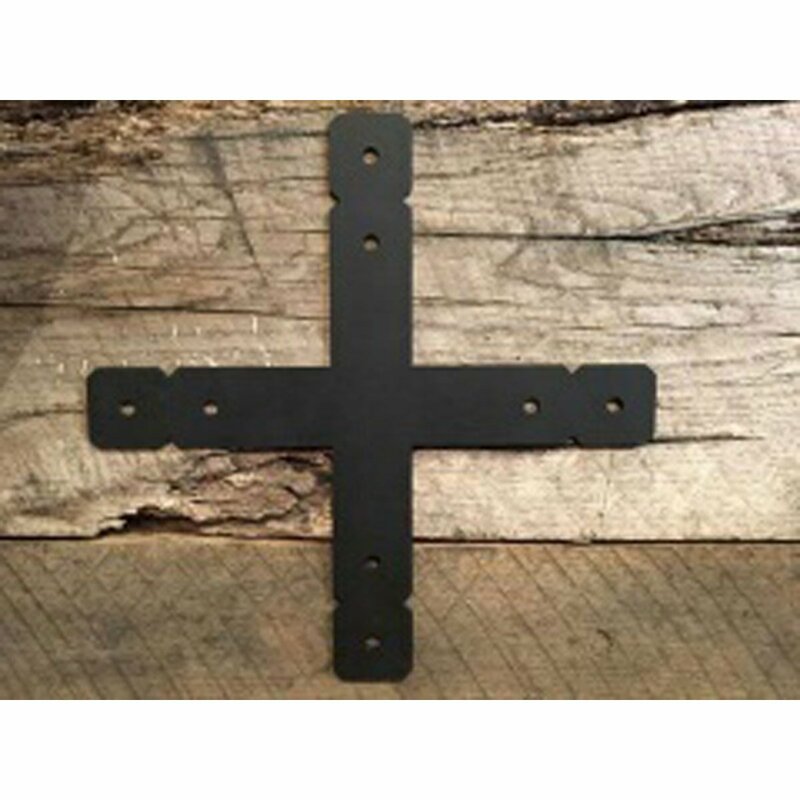 Connect some exposed beams together by adding these timber connecting steel brackets, built to your spec. 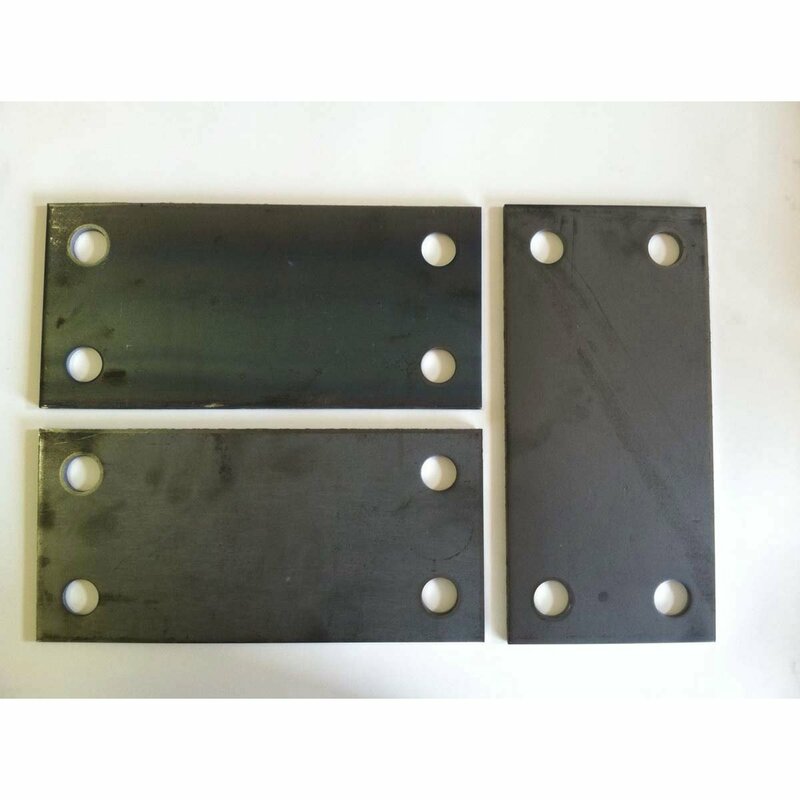 Thickness, size, hole placement, hole size. We make them just right for your project. 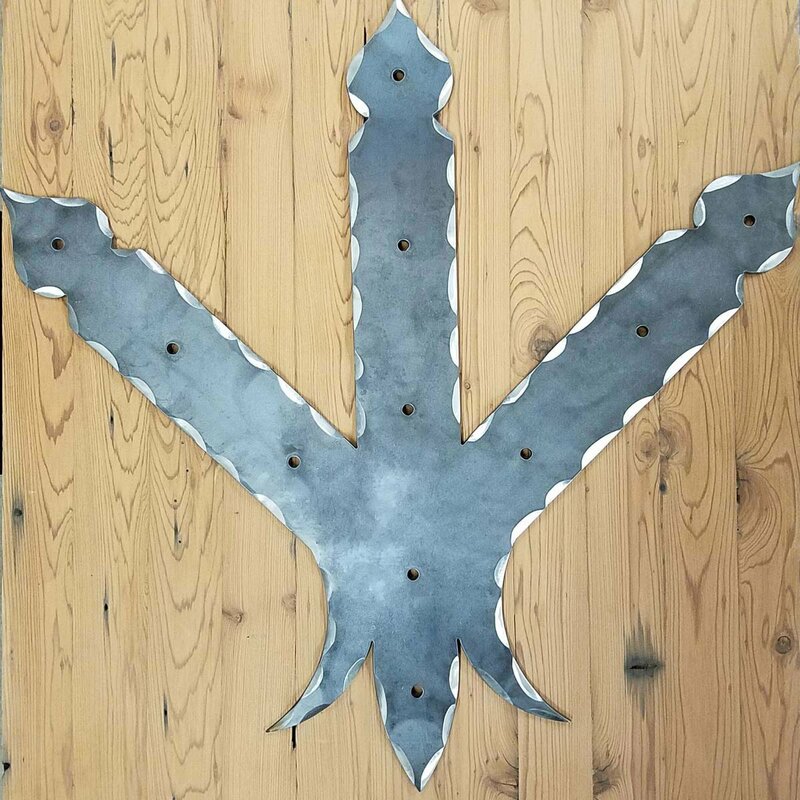 We can paint or powder coat them if you request that. 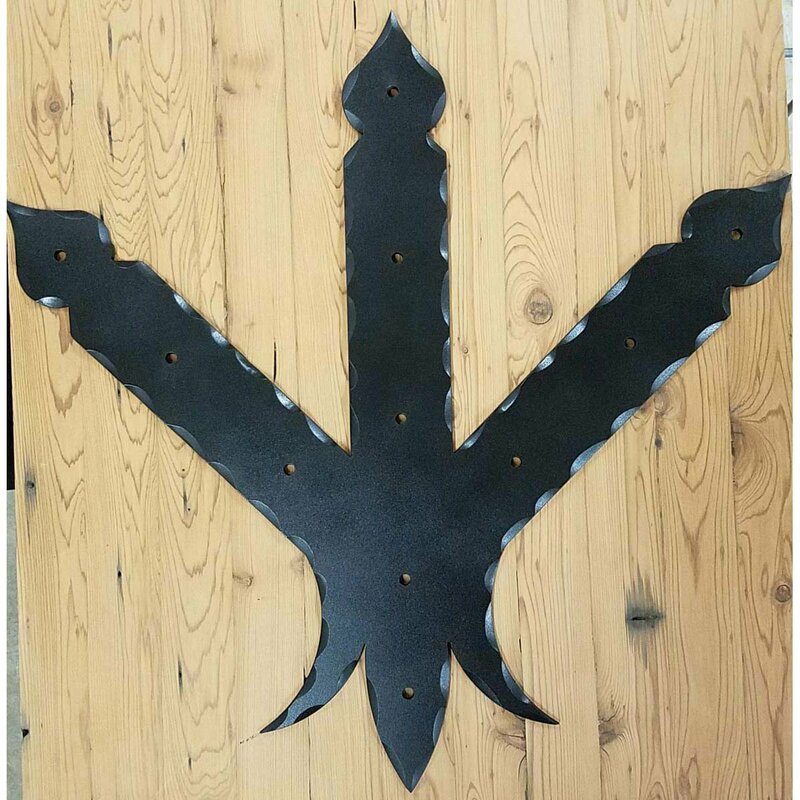 We can handle any size order, small or large. If you'd like to order some, give us a call at (715) 718-0781. 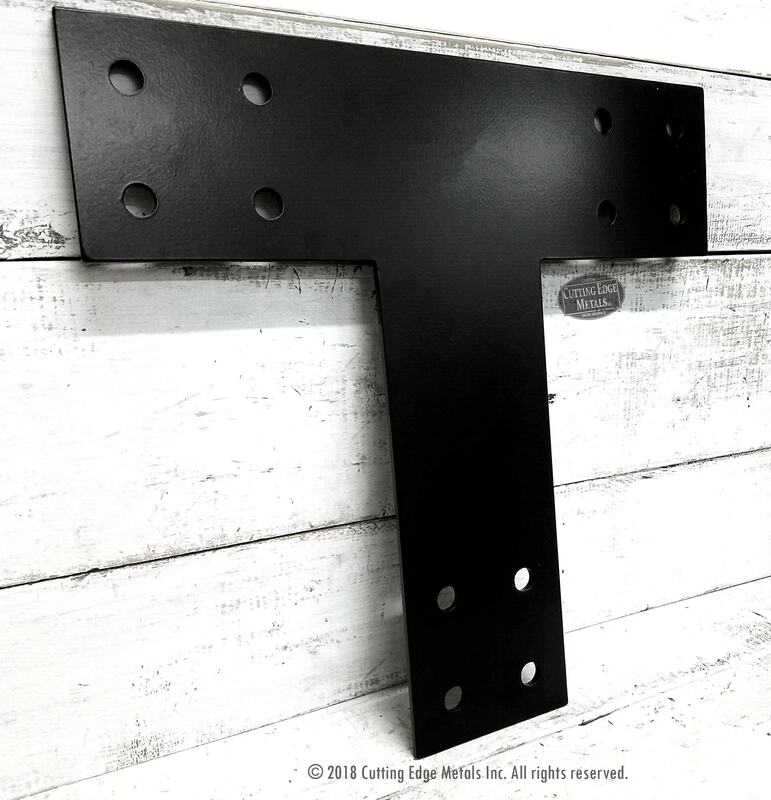 If you want to add a cut out design to your custom steel connecting timber bracket, you can! 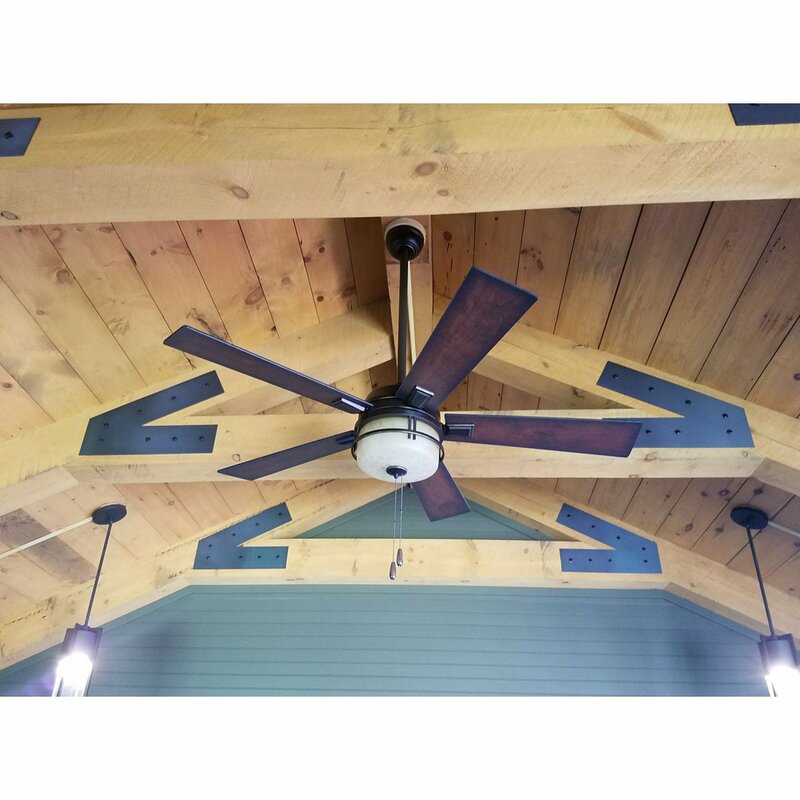 Just give us a call at (715) 718-0781 to discuss your project. We can just about do anything you'd like. 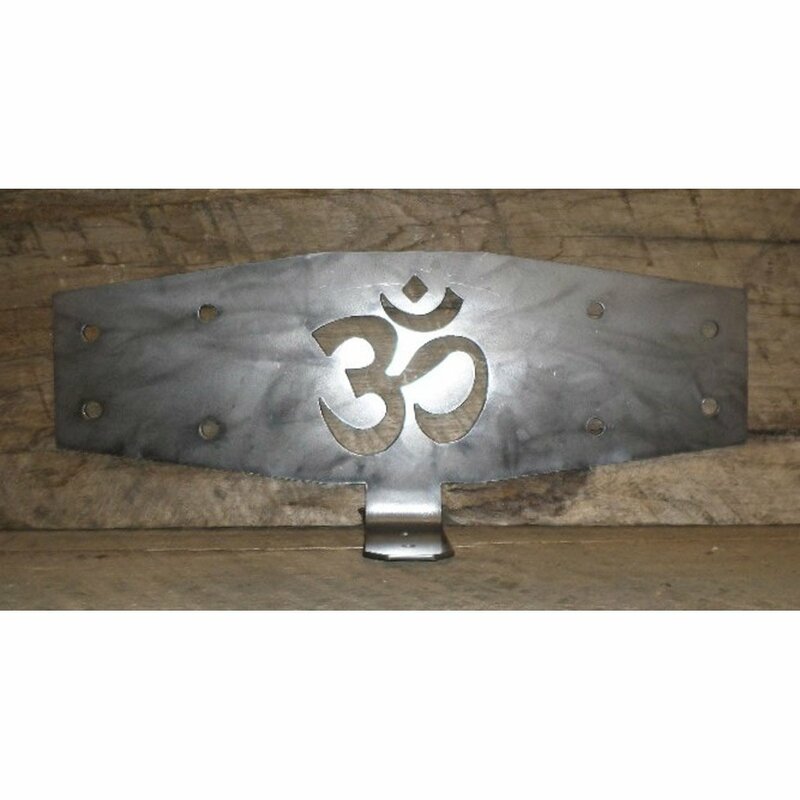 Decorative "Facial" Post and Beam Brackets custom made to dress up your timber framed home, cabin or office. These will also add value to your property. 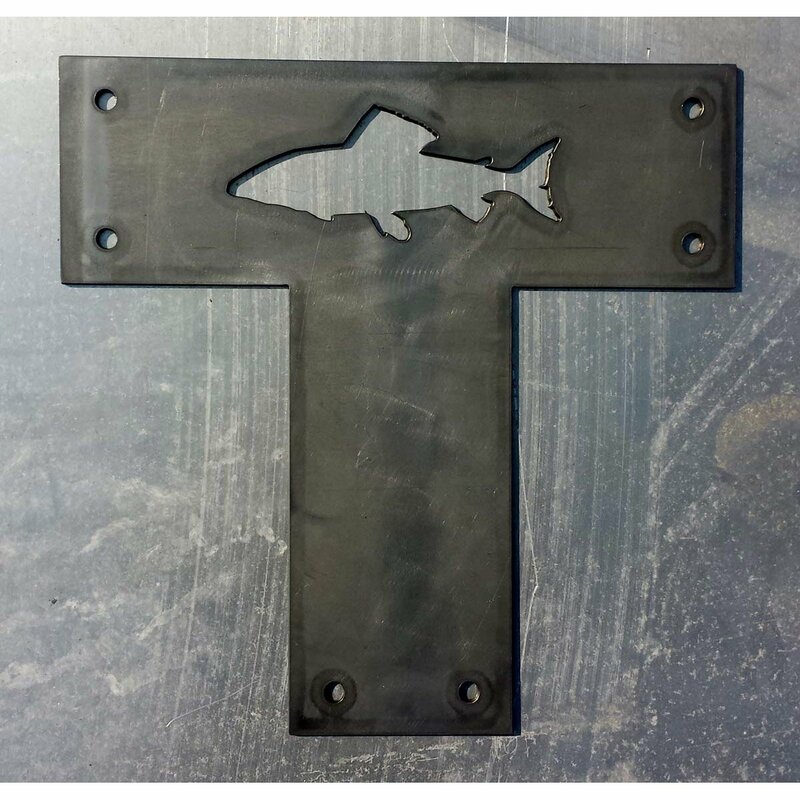 We can make them any size, thickness, hole placement and size. 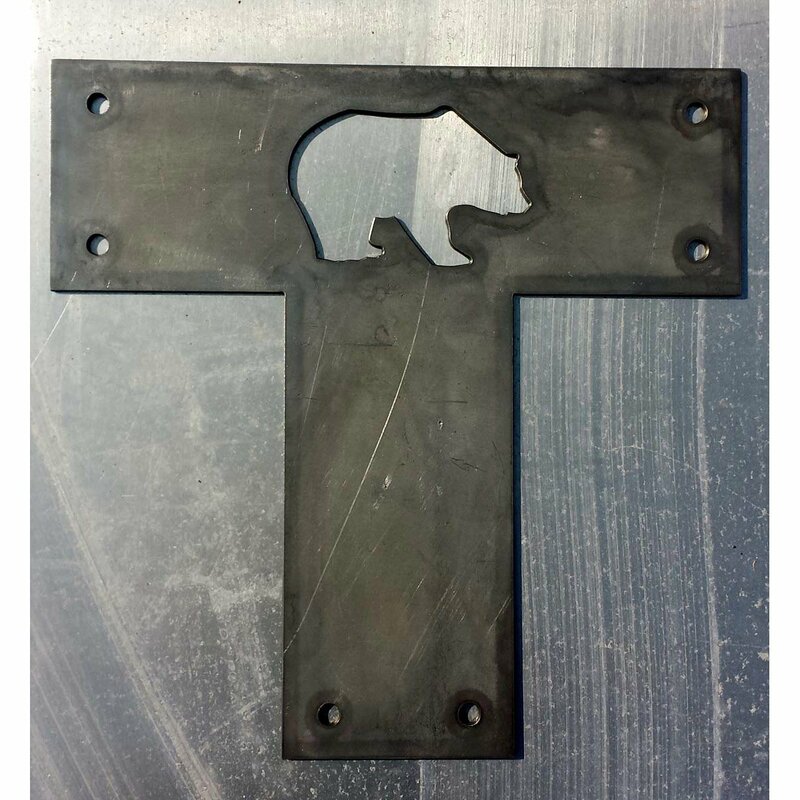 Also, we can hammer them, give them a painted or powder coated finish or just leave them bare. If you'd like to order some, give us a call at (715) 718-0781. 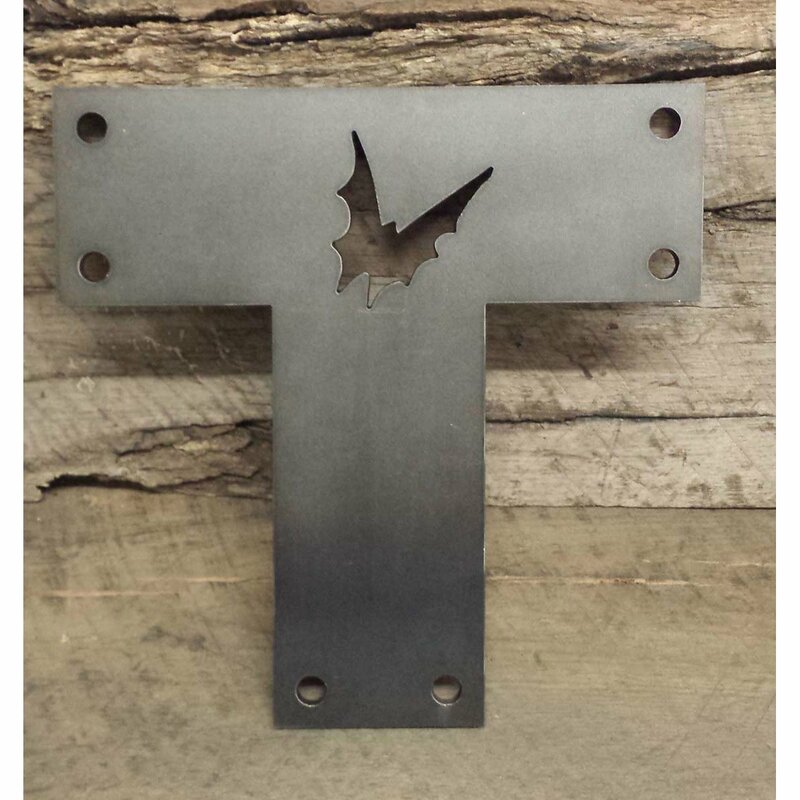 You can add a decorative cut out to your facial timber frame bracket if you like. Just ask and we can almost always make it happen for you. If you'd like to order some, give us a call at (715) 718-0781. 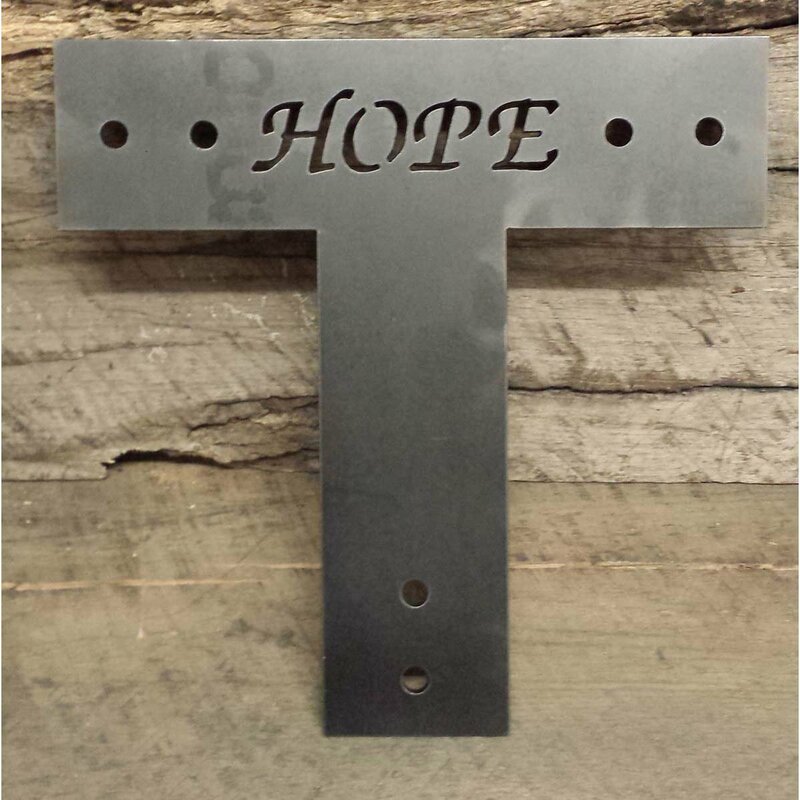 A uniquely designed steel "X" bracket that has a double cropped feature to add some detail to a post and beam. 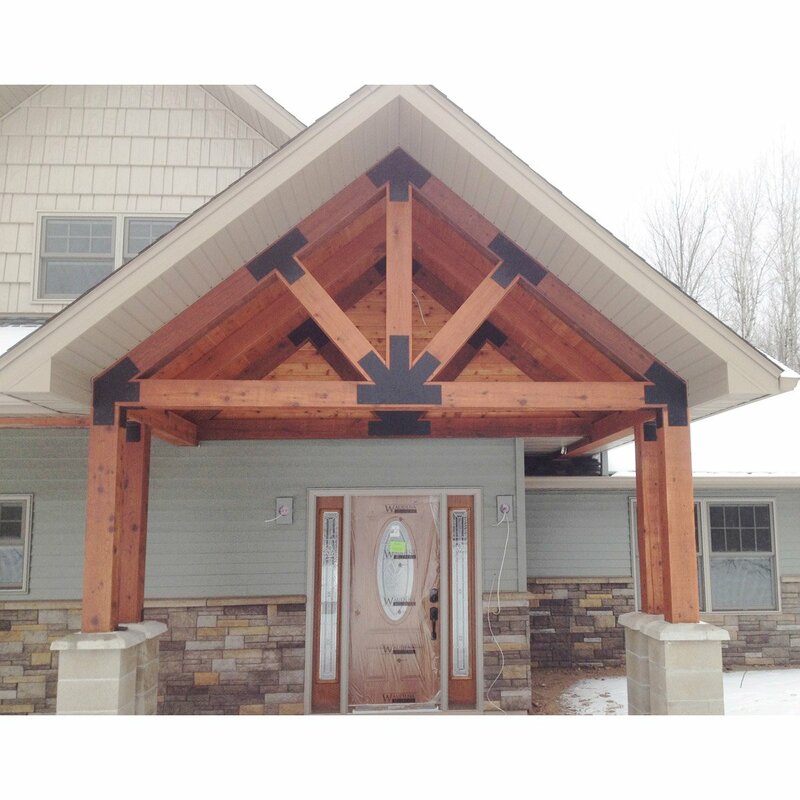 This is a nice way to dress up your timber frame project and add that look you're going for. 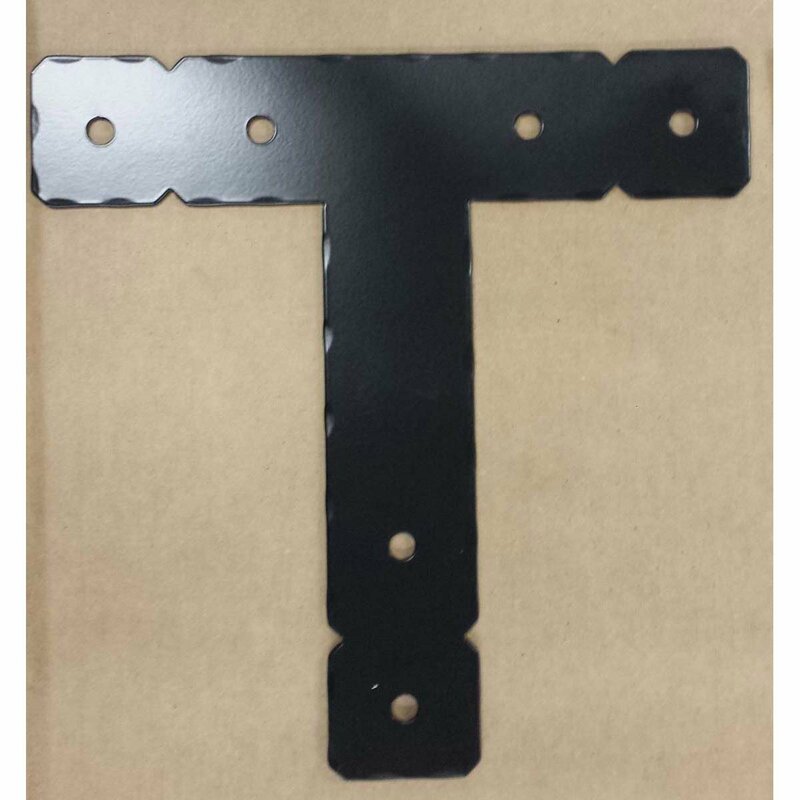 Also, take a look at the "TB-12" and the "LSB-12", which are the sister brackets to this style. If you'd like to order some, give us a call at (715) 718-0781. 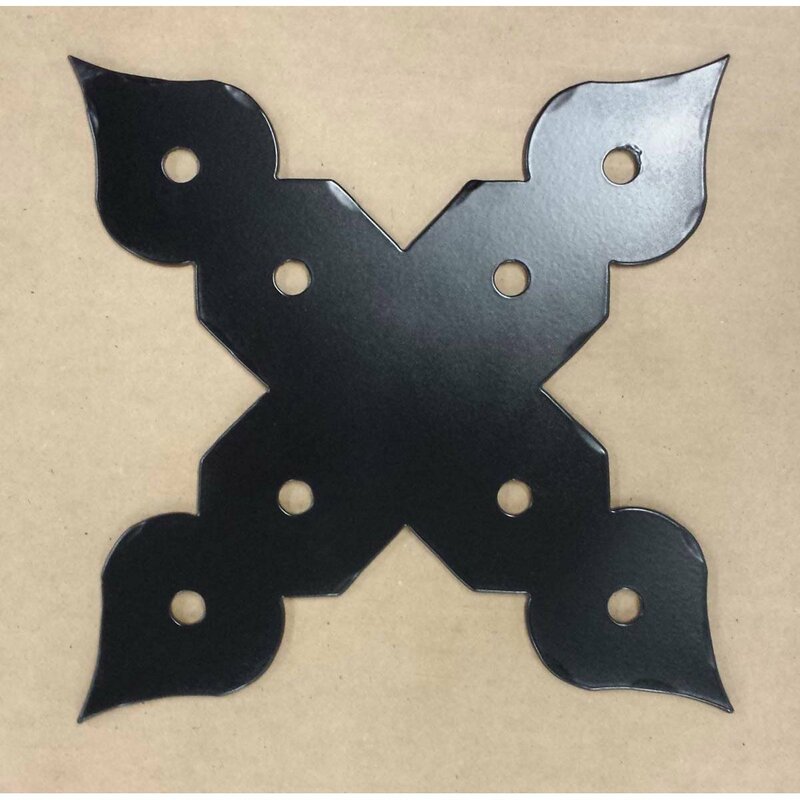 Beautifully designed spade "X" brackets will add a really nice detail to your timber frame project. 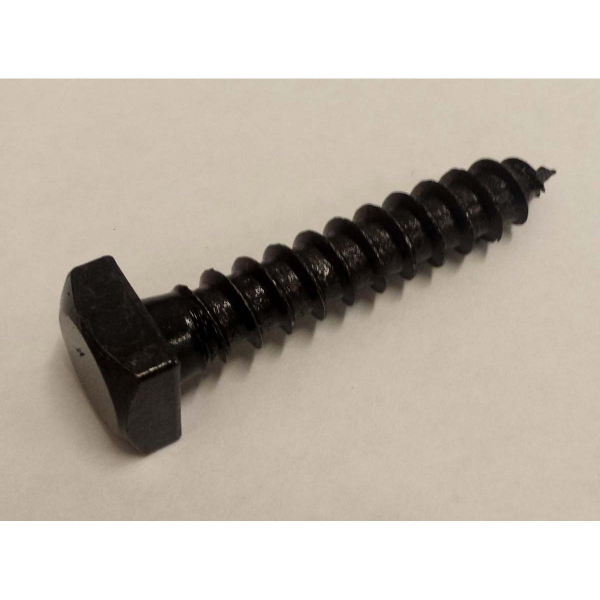 Add these to a post connecting to a set of beams. 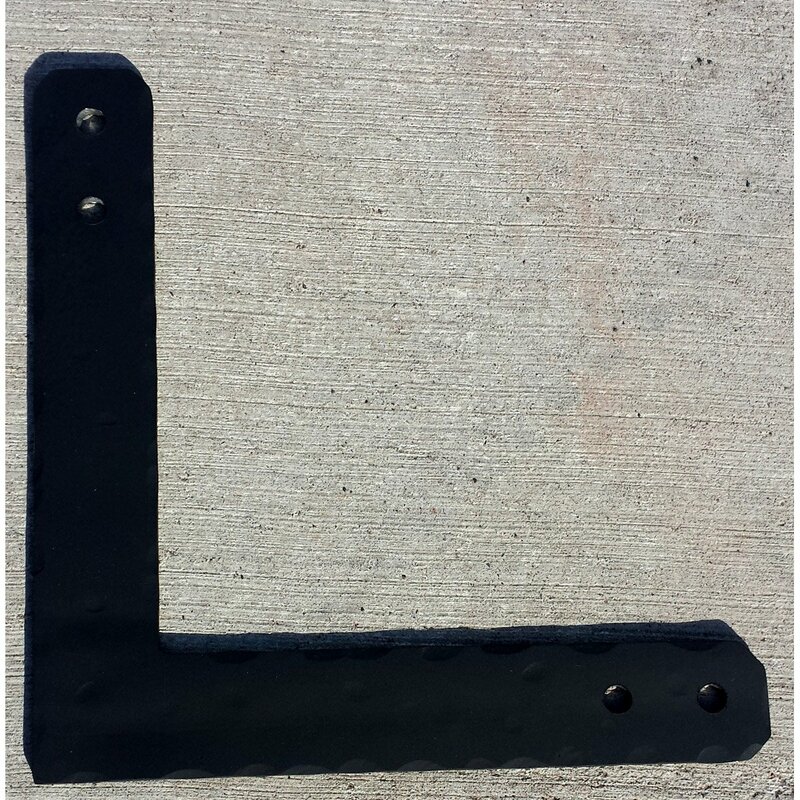 You can marry these with "L" and "T" brackets to match. 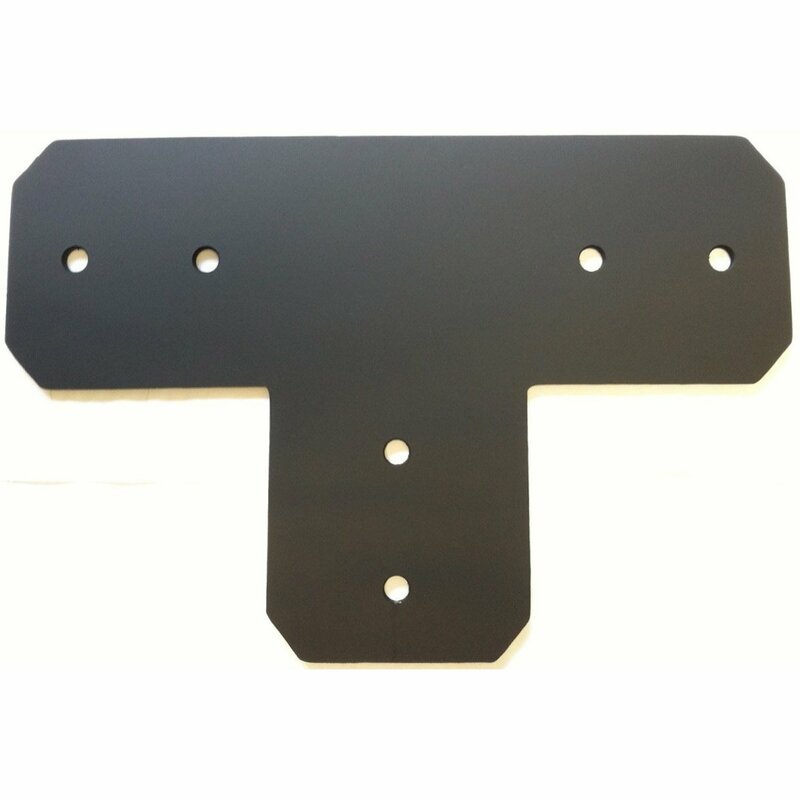 Give us a call at (715) 718-0781 to discuss these brackets. 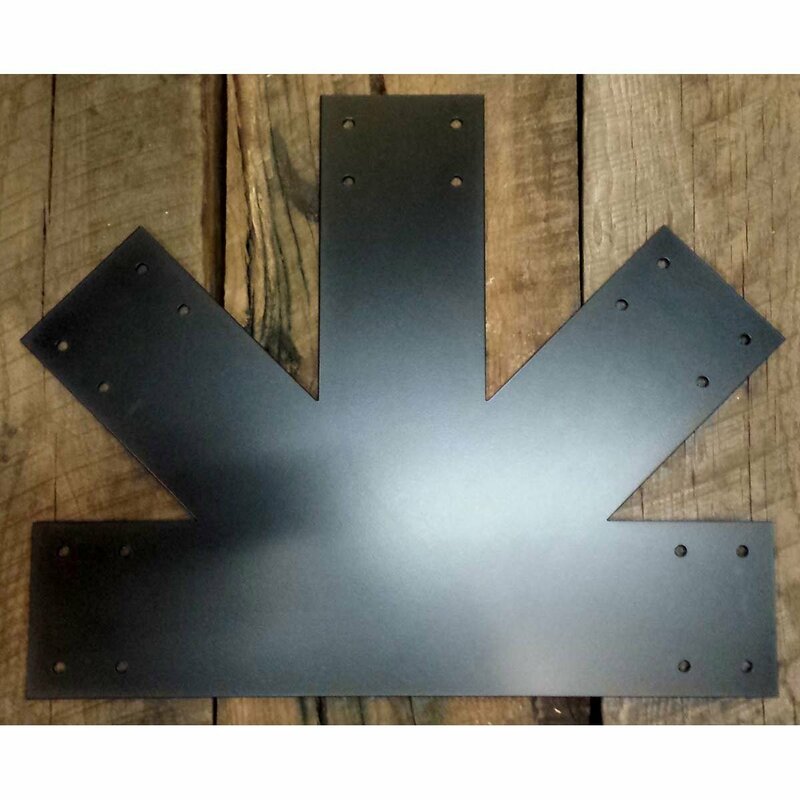 These are a custom ultra decorative steel 5-legged truss brackets. 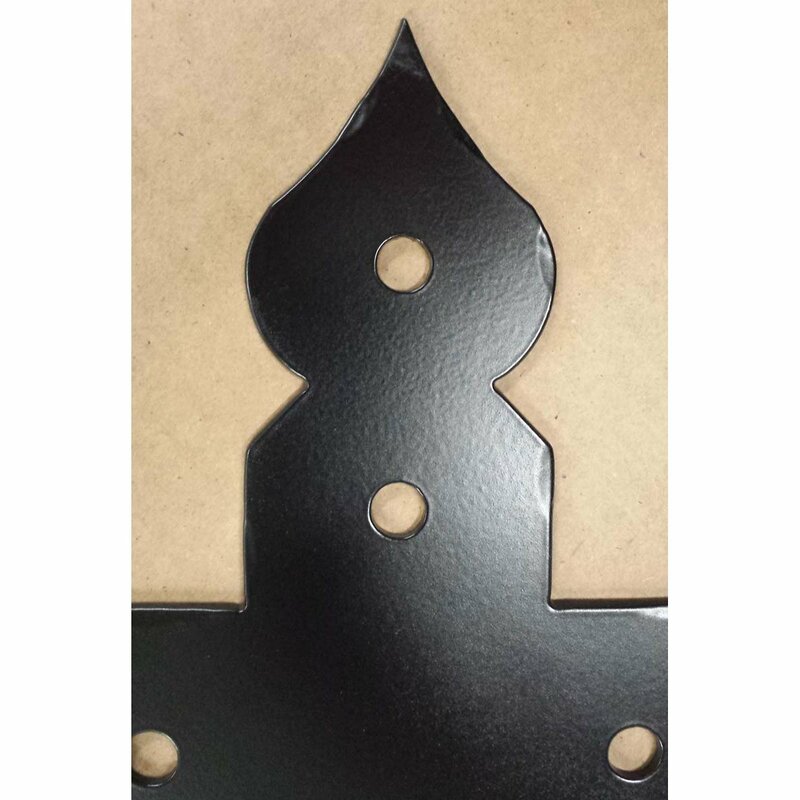 This beam bracket will dress up your timbers to look like they are in a castle. 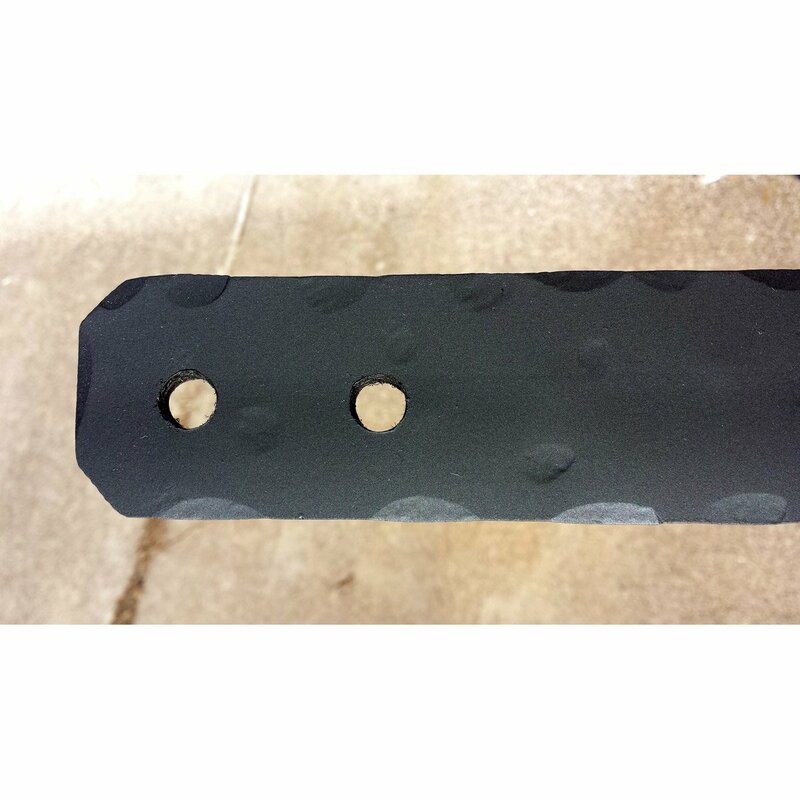 This goes on the collar tie and connects the king post and queen-angled posts to make a solid truss connection. 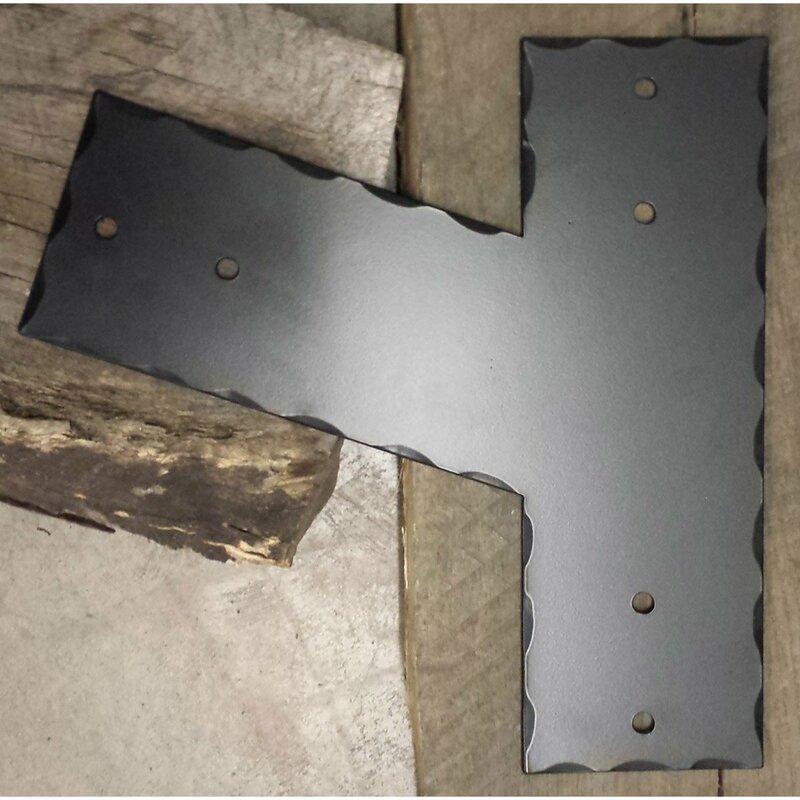 We hammer these to add more design and dimension. You can order these by calling us at (715) 718-0781.